As the content director for Martingale, it’s easy to be inspired by all of our authors’ work. Every day I’m surrounded by beautiful new quilts, pillows, table toppers, embroidered goodies, and more. Very often I find myself saying, “I want to make that.” Then time slips away, another box of quilts comes in, and I start the daydreaming process all over again. But not this time. A few months back while working with author Lissa Alexander on her book Oh, Scrap!, I thought, this time I really am going to make that project—and I did! And it was easy and fun and I love the result. First off, I love scrap quilts. My favorite genre. But with a full-time job and a home to run, I don’t always have as much time as I’d like for sewing. Enter the mini-charm-pack scrap quilt. Even though I have more fabric squirreled away than I care to admit, Lissa’s tip for those new to quilting— or those who don’t have a stash of scraps—is to start with precut squares. In this case, mini charms, which are 2½" squares. Each mini-charm pack has 40 squares from one line of fabric, offering a little taste of each fabric in the line. For some reason, Lissa’s tip resonated with me. It was as though she gave me permission for a fresh beginning. I didn’t have to rummage through bins and baskets looking for just the right colors. I could start anew with mini charms. And that’s exactly what I did. Plus Marks the Spot is the first quilt in Oh, Scrap! and it’s beginner friendly. You don’t need lots of experience, because it’s made with the simplest of shapes—squares. And you don’t need a stash—you can start with a couple of packets of mini charms and one background fabric. It couldn’t be easier. Making this quilt was so freeing—I wasn’t beholden to fabrics on hand, and I didn’t feel guilty for ignoring all my scraps and buying new fabrics, because mini charms are very affordable. And each little packet comes already cut to exactly the size you need. I could just divvy them up and get sewing. I do have one word of caution for you, however. Sewing this quilt is addictive. I couldn’t stop at the number of mini-charm packs called for. Four days after my initial purchase, I went back to my local shop and bought several more packs and made my quilt slightly larger. Not because I needed it to be larger, but because I was having fun! Quilting doesn’t get much better than that. So whether you’re a seasoned quilter like me or you’re just starting on your quilting journey, Oh, Scrap! is a fun book with so many ideas and tips that I bet you can’t stop at just one quilt. I know I can’t. Next up, Izzy Squared is calling my name. 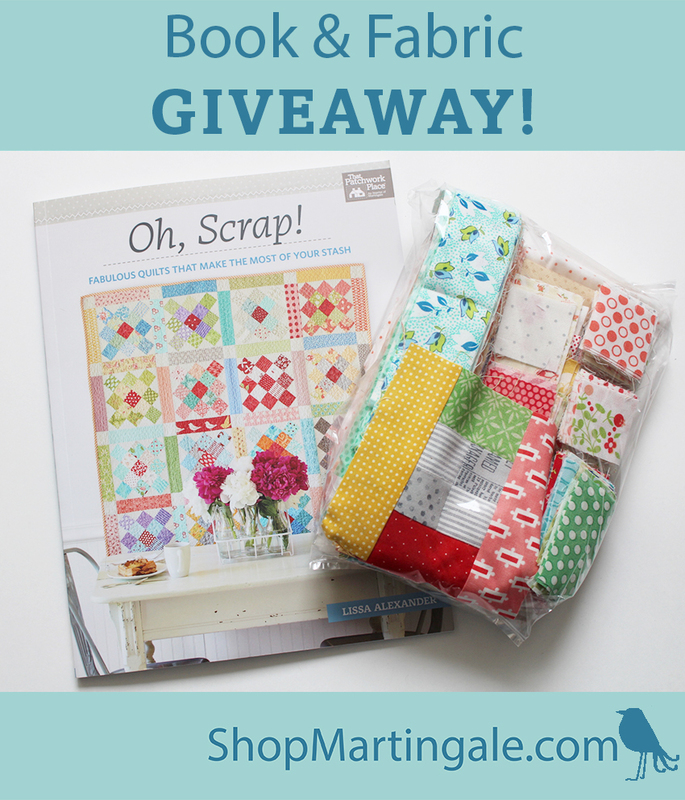 Today we’re giving away a copy of Oh, Scrap! and a one-of-a-kind collection of scraps created by Lissa herself, while she was working on her book! How many mini-charm packs are in your stash right now? Tell us in the comments! We’ll choose a random winner one week from today and let you know by email if you win. Good luck! We’ll email you about your prize, Karen—congratulations! I have 4 and a jelly roll waiting to be cut. I’m in the 1 to 5 category. It’s not something I buy often or even look at much, but this will change how I look at them. Sadly I only have one! I do not have a single mini charm pact, but layer cakes and jelly rolls are plentiful. I have at least 6-10 mini charm packs several jelly rolls and lots of charm packs, I’m a collector what can I say! I don’t have any actual mini charm packs, but I have cut some of my own on my Accuquilt from scraps. I have way too many scraps. Great book. I need to win. Off to the quilt shop! Always! many more than 10 but who’s counting………………..
1-5. "Oh, Scrap!" looks deliciously fun! Thank you for this wonderful opportunity. 1 to 5 but they are hard to resist. I have more than 10 min charm packs in my collection……probably closer to 25 or 30 …… they are fun to collect and one day will make an amazing scrappy quilt! Perhaps one from this book! Aha! I have more than 10….. They are the perfect thing to mix with scraps when I need a quick gift or just need to sit and sew something after a hectic day. 6-10. I like to use my own scraps better than I like using charm packs. I’m in the 6-10 category these little packs are so cute I just love them! I would say I fall into the 6-10 range…maybe more. I love those little guys. So cute! I have 1-5 mini charm packs; really, only about 200 2 1/2″ squares. ;). Sadly I have none, but on my wish list now! Hoping I get lucky and win. I’m in the 10 plus category! They are perfect for EPP 1” hexagons! I can’t pass them up, especially if they’re on sale. I have don’t have a charm pack, but have a jelly roll and a layer cake and lots of fabric waiting to be used. 6-10 mini charms…Sew Cute!! Inspiring article! 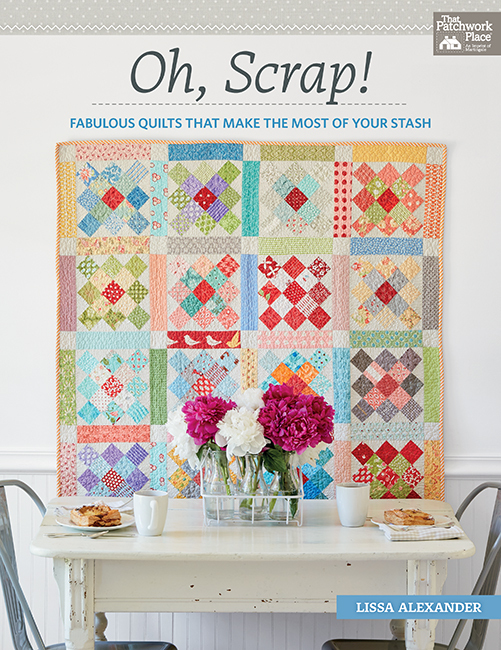 I love scrap quilts and can’t wait to get this book! I think I have around 10-15 charm packs. Thanks for the opportunity to win! I am in the 1 to 5 category but I have been known to cut up my charm squares to create mini charms. I have been bitten by the mini quilt bug and mini charms are perfect for those projects. I have 1 pack of mini charms but many jelly rolls and layer cakes which can be cut down to mini charm size. I think this book will find its’ way into my sewing room! 1 – 5 is what I estimate. Have not had patterns for their use until now. I have about 25 mini charm packs and lots of scraps that are just waiting for the perfect pattern. Would love this book to get more ideas on how to use the little pieces. I think there are four, but that doesn’t mean I can’t buy more, or cut up some 5” charms. This looks like fun! I have 3 of them and have wondered what to make them with. This book looks like it has some great ideas that I, as a beginner, could make into quilts. I don’t think I have any mini charms!!! Oh no! I see a shopping trip in my future. I’ve had mini charm packs in the past and loved using them! I love making quilts from my scrap stash!! Look at them all the time. They are addictive and make a great pillow.I have 6 to 10 at any one time. Maybe a lap quilt would be fun to make. Thanks for the chance. I have 6 to 10 packs of mini charms as I can’t resist them. Then there all those scraps cut into squares. I am always looking for projects to use those small squares ant this book would have that inspiration. Thanks.. I have way more than 10. I have about 10 mini charm packs. So easy to toss into the bag when making another purchase. Oh, my! I have 1 to 5 mini charm packs that I bought in a cute little tin at a Quilt Show. Now I know what to do with them. I have lots of other charm packs and jelly rolls, too! I love the variety! Karen, thank you for showing us your scrap quilt. Love it with the warm reds in the center blocks. Must admit it looks like a fun and doable project. Charm packs: just started using two of mine for a small project but I have quite a few jelly rolls that can be used for those squares if needed. The books looks like a very good one to work with. As an experienced scrap quilter with an insatiable obsession with fabric, Lissa’s book is wonderful. I have marked several quilts I’d like to try including one for my first grandchild. I probably have 6-10 precuts right now and mix and match with my stash every chance I get. The patterns in this book are lovely! I have only one as well but I am working on collecting 2.5 inch scrap squares! I love the fun nature of this quilt! I probably have 6-10 mini charms in my stash. Lots of layer cakes, jelly rolls, and charms. I have more than 10 and love having all the line from the designer in my hand! Like your article and love this giveaway, too! Thanks! 1 to 5, so may need to get the book so I can use them up. I may have 6-10 mini charms in my stash. I for sure have more than 10. I just can’t help myself, they are so adorable. I do not have any mini-charm packs at this moment. I have three and they are all different, was planning to make mini quilts for gifts from them but haven’t gotten to them yet. There just isn’t TIME!!!! There are only 1-5 mini charm packs in my fabric collection so far, but Lissa’s book looks like fun! Thanks for offering this chance to win her book and mini charms! I have just 1-5 mini charm packs, but I have lots & lots of regular charm packs that can easily be cut down. Thanks. 1 to 5. Maybe I need this book to use them up. I have hundreds of mini charms collected I cut up scraps and after working with Jelly Rolls I am looking for inspiration to use them. I have at least 3. I like to use them to make hexies. No mini charms, but 10 charm packs! I only have 5, but I can see that I need more!!! There are just a few mini charm packs (1-5) in my fabric collection so far, but Lissa’s book looks like lots of fun! Thanks for the chance to win her book and more mini charms!! I currently have 3 mini charm pacts. New book looks great! I don’t have any mini charm packs, but I would love to have some. Cutting fabric is not my favorite part of the quilting process. I would guess 1-5 category because I never know what to do with them…now I do! None! Clearly I need to go shopping!! 0. I enjoy cutting as part of the whole process. Besides, What’s the hurry? I am in the way over 10 category probably more like 25. I really need to start using them. I don’t have any mini charm packs, would like to get some. I love, love any books to do with scrap fabrics. Nice patterns! Just between one and five right now. They sure are fun to collect and use. i love mini charms and i have several packs; could be more than 10! they also make great gifts for my gal pals; easy to pop in a card. I only have two mini charm packs, but don’t forget, you can easily cut a charm pack into four mini charm packs! Tada, instant quilt! And it is more economical to do it this way. I’ve never seen the point of these little squares. But your sweet quilts has made me a believer. More!! I have 8 mini charm pacts and always wonder what to do with them! It would be great to win!!! No mini charm packs, BUT there are 20 full charm packs, multiple partial charm packs, 15 layer cakes, 4 jelly rolls and endless FQs and yards and yards of fabric. I have 1-5 mini charms waiting their turn so this Pattern is a great idea to use. Thank you for only asking about mini treats — not sweet treats, jelly rolls, charm packs, cake packs, strip packs — oh my! Mini treats only 3. I have about 6; they’re adorable, but I never knew what to use them for. Now I do! None. But, lots of charm packs. Looks like a great book. 0. I enjoy cutting as part of the whole process, Besides, what’s the hurry? Right now I have 10 mini charm packs in my stash! Thank you so much for this wonderful giveaway! I have 6-10 peering out of my “Precut” bin right now ready to hop out and become a quilt from this book! I am currently working on 2 bags of precut mini’s. They are great! I only have one mini charm pack but lots of scraps waiting to be cut. I love the scrappy quilts so would enjoy the book with more ideas. Oh I’m definitely a charm pack junkie…have countless kits of charm packs just waiting for that just right pattern…this book would certainly give me some awesome ideas. Thanks for the opportunity! I have 5 mini charm packs waiting for inspiration. I love any thing to do with scrap fabrics, the books look like fun quilts, nothing too hard. No mini charms in my fabric stash at the moment. I don’t have any mini charm packs in my stach,but would love to have some along with the book of patterns. Thanks for a chance to win! Only 2 mini-charm packs at my house. Bought some to make a mondo bag which was a huge success. All coordinated fabrics so no thinking. BUT I do have lots of 5 inch charms. Just cant resist those packs for my scrap quilting. just one, waiting for a cute project before I buy more! I have not used mini charm packs but I have cut 2.5″ squares out of all the fabric leftovers from dresses I made for my daughter when she was little and made a quilt using those. Not counting, cause there’s more than 10. What can I say, I love fabric in any size or shape and those 2 1/2 inch squares are so cute! Thank you! I have more than 10! This looks like a great way to use them! I have around 12 mini charm packs. My thought is they will make wonderful table runners when combined with a background fabric. I love any scrap quilts, nice patterns. Would love to own this book. No mini charm packs in my stash at the moment. I don’t have any, but this definitely interests me to get some. Those quilts are beautiful! I have 6-10 charm packs in my stash waiting for inspiration for how to use them. Hey, Karen – you said you were making this quilt and I love it! Since I didn’t like my version I think I’ll start over and try your look. I LOVE this book – you and Lissa did such a nice job on it! More than 10! I love them! I don’t have any charm packs. You gave me a new way of looking at them. I’m heading to the quilt store! I have seven that haven’t been used yet but stacks and stacks of charm packs that will come in handy. I only have 3 mini packs at the moment but after seeing just this one quilt, it made me realize how I had overlooked an really inexpensive way of making some really cute quilts (gifts)! I have several jelly rolls and cake layers – looks like the mini charms are about to invade! I fall in the 6 to 10 category, probably eight. But I’m also headed to my local quilt shop today. Have about 3+ am sew afraid to cut them, but now have some confidence and a plan. Thanks for your energies and the fun of winning! I believe I only have one mini charm pack in my stash, and I have been looking for a pattern to make good use of it. Headed to the quilt shop right now! I have other sizes of pre-cut fabrics, but not the mini charms. I also love quilt books! I have just over 10 – thanks for the opportunity to win this great book! Let’s just say that I feel like I should join mini-charm pack anonymous and that I have more than 10. This book is exactly what my I need! Not counting, cause I have more than 10! Just love those cute little squares and the wonderful ideas to use them! Love the book and all Lissa’s quilts! Thank you! Zero mini charm packs, ever. I don’t own a charm pack , but I do have a couple Jelly rolls that would lend itself to that. 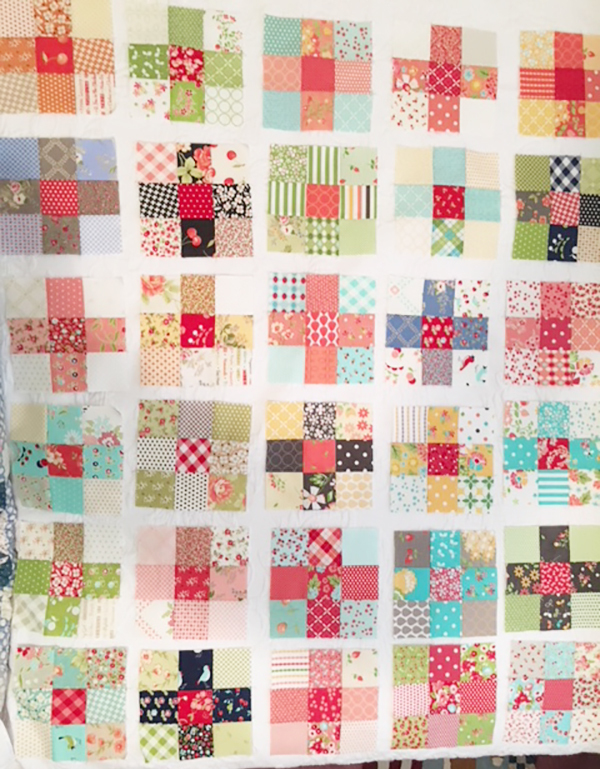 I also have saved hundreds of scraps – I suppose it would be good to cut them into 2/12″ squares and use them up ! Thanks for a chance to win this book – I have just over 10 mini charm packs. I don’t have any mini charm packs, but a box full of 2 1/2″ squares, so I guess they would equate to at least 10 mini charm packs. I’m in the 1-5 category. Might be time to do something with them. Great ideas. I do not have any mini charm packs. What I do have are four plastic bins, one for light 21/2 inch squares, one for dark , one for fabrics with golden hues and one for assorted. These boxes are close to my cutting table and no fabric scrap goes to wast, if I can cut a 2 1/2 inch square out of it. So looking forward to making a quilt top out of these scraps, using the pattern in the book. Think only one or two…but KABOODLES of scraps waiting for a new pattern! This book looks awesome! I have one that I won at a meeting. None. I have yet to try this precut. I have a half dozen purchased mini charms but plastic shoeboxes full of self-cut mini charms. Thanks for the chance to dream of winning this give-away. Not sure how many mini charms I have, a while back going through my stash I cut a lot of my scraps into squares of all sizes but most of it is 2 1/2” squares. This book would certainly help me use quite a bit of my mini charms. **GASP!! ** I do not have any mini charm packs hidden away in my stash!! Jellys & layer cakes sure, but alas, no minis! I have 5 mini charms one of which I am working with. Oh gosh, I am in that 6-10 crowd! but my scraps? they look so dull compared to these! I have two Moda mini charm packs with 42 squares each. Then I have a Pineapple Fabrics pack with 20 squares and a Northcott 21 microchips pack. To make one of the projects in the book, I’m sure I would need to either buy more mini charm packs or cut 2-1/2″ squares from my stash. But, no matter, I’m loving the idea of the book and would love to create one of the projects. Let’s just say that I should join mini-charm pack anonymous and that I have more than 10. This book is exactly what I need! I only have one mini charm pack, my LQS doesn’t carry them, but I have tons of fat quarters and yardage. I have maybe 2 or three. I’ve been thinking about buying more for just this kind of project. I’ve also been thinking the minis might make great and easy hexies. Would love to be the recipient of this prize. I am in the 10+ category. I can’t resist them, they are so cute. And I know that when I find the right pattern, I’ll need more than 1. Love the ideas in the book. I have 6-10 mini Cham packs. I have found they come in handy for many different things. I have no charm packs, but a couple jelly rolls and loads of scrap pieces that could be cut into 2 1/2 " squares. Trying to cut back on my stash ! I have two I think! I am using 2 charm packs right now with a layer cake and several jelly rolls to make a twin size quilt for my great niece. I only have one at the moment. On a spending freeze until the stash is reduced a bit. A chance to play with someone else’s scraps would be welcome. Only two right now. But have several jelly rolls. I will be buying some on June 11 at the quilt shop. I have to be honest here…more than ten and I’m awaiting the arrival of two more I ordered online this week. I have 8 charm packs but only 1 mini charm pack that I got at the Houston Quilt Festival. I would love to have more mini’s. Thanks. ZERO! I don’t have a single mini charm pack but I could easily put one together from my cut squares stash. This book would make great use of my stash of 2 & 1/2 charm squares. I have at least 10 charm packs in my stash. I probably have 6-10…..they are pretty addictive to buy and have. I don’t have any mini charm packs, but love the idea! And I LOVE scrappy quilts! I have 0 charm packs have never tried working with them but this look like a great way to use up my own scraps! 1-5, but I can certainly cut more!!! lol Would love to win the book. I purchased the downloaded version but the book would be so much easier to use!! I have 5 mini-charm packs just waiting to jump into a quilt!!! LOL. I have at least 20 Charm Packs in my stash – plus multiple 5″ squares that are not part of packs. I have 1 to 5 in my stash! I, also, have about 10 layer cakes and 10 jelly rolls! I’m addicted to precut! I have 8 charm packs but only 1 mini charm pack that I got at the Houston Quilt Festival. I would love to have more. Thanks. I have a shoe box full! I buy them on sale to send to my granddaughters in another state. They are 9 and 11 and enjoy ‘making pillows and doll blankets’ with them. Have been looking for patterns for me to make with these collections – and this book looks like it fits the bill. 1-5 charm packs. Great book! Love precuts of any size! It’s a great way to get a variety of fabrics. I have numerous charm packs and jelly rolls. I have a few charm squares that I have been using to create hexies but using them in a scrap quilt may be easier and more fun. I’ll definitely be looking at charm squares with a new vision. I have one, but have never been sure on what small project I should use it on. I do not have any mini charms but on my way to fabric store. I have a box full of 2 1/2″ squares which may equate to at least 10 mini charm packs. I have 4 that I picked up in goody bags. I’m glad I saw this as I wasn’t quite sure what to do with them yet. Not sure – spread over two places- at least 7- maybe more than ten?? At the moment I only have 2 mini-charm packs, but I do have some ideas of how to put them to use! Thank you for offering this contest; I would love to win. Love this book! I have 5 charm packs at the moment. I have about 10 just waiting to be made into something inspiring. I have several but have not used them yet; this book would be the impetus for getting started! I only have one mini charm pack – free gift from a shop hop I went on. I have 6 right now and am always reluctant to use them because they are so cute! I have a partial fat quarter stack to use to make extra quilts for when the grandkids come for a visit! I used some of it to make my mom a table runner and will use some of it to make some couch cushions for her but then there will be some left over to make a quilt! I would love the kit to make a quilt for the grandkids. This pattern looks so East to whip up! I don’t have any purchased mini charms, but have a whole tray of 2-1/2” squares cut from scraps of previous projects. They are gathering dust, so would love to have new ideas for using them. I have over 10 mini charm packs. The minis are the perfect size for stitch-and-flip corners. It would be superb if there were more packs of solids (with the same/similar color in the pack) and more blenders, tone-on-tone mini-charm packs; like fossil fern, grunge, batiks, etc. These could be used with those luscious prints we all have to make snowballs and other flipped-corner units! I only have 2 right now and I am trying to figure out just what to do with them. I bought them because they were pretty. cute. Lissa’s book is on my list of have to have. I still like the old fashion way – cutting from yardage! I must have between 1-5. I have more layer cakes and charms that could also be used for scrap quilts! No mini charm packs at the moment, but some layer cakes, a jelly roll, several fat quarters (with more on the way) and lots and lots of scraps. Mine at the moment. I just put together a table runner with a mini charm pack. I have 6 at the moment just waiting to be used. I have 3 mini charms for a bag project but I have loads of charm and layer cakes!!! Scrap quilts are my favourite! Thanks for the chance to win this great book!! I don’t have any of the precut packs. I always have plenty of scraps in my stash to do scrap quilts. I have 3 currently. I also love scrap quilts and the chaos of color it creates! Thanks for offering this giveaway. Currently I do not have any mini-charm packs in my stash. Your article gave me motivation, and a reason to complete a scrappy quilt. Good Morning! I don’t have any mini charm packs in my stash right this moment but I have been cutting 2.5″ squares from leftover fabrics for a bit. I just love this book and especially the scrap collection. Thank you for the opportunity to win it. Only two at the moment, however after reading this article I think I need more. I have 1-5, I think, lol…my stash is in 2 states right now, so I never know where anything is! I don’t usually buy minis but have gotten several in our guild’s birthday drawings. I usually cut up fabric scrap leftovers into 2 1/2” squares that equal minis, so does that count? If so then there’s no counting those, and they are ready to be used. “Oh, Scrap!” Would be a perfect way to use some up!! I have a stack of fatquarters I’ve used part of to make a table runner for my mom and will make some couch cushions for her out of some but then I have some left over to make an extra quilt for when the grandkids come or visit! I would love to win a kit and book to be able to make another one. These patterns look so quick and easy to whip up! I am a beginner quilter. I have never used mini charm packs before but this looks like a fun quilt (just like you said). I am going to go buy some today! I only have a small number of mini charm packs. Less than 5. I like the small size, but I just rarely buy them. Mainly because I have tubs and tubs and tubs of fabric and my deal now is to use up what I’ve got and only buy new if I have to. But scrappy quilts are my favorite kind. I am working on right now that I may enter in the Kentucky State Fair. I just need to get in gear. Only two at the moment, however after reading this article I need more. I have at least 10 and a few charm packs cut into mini charms as well! Mini charms are a great way to see if you like a fabric line – or sometimes I see one or more fabrics in a pack that I have to find more of. I don’t have any precuts. I have plenty of scraps in my stash. I have two mini charm pack, one Halloween and one Christmas, but I have two jelly rolls of the same color way and thought I could start there. I do not have any mini charm packs, but I love the idea. And I LOVE scrappy quilts! I have more than 10 mini charm pacts. Probably close to 25 different pacts! Way more than 10! Also a tip: buy charm square pre-cuts (5″ square) and cut them in half both vertically and horizontally and you have 4 packs of 2-1/2″ squares. I probably have half a dozen – plus lots of full-size charm squares waiting to be cut down! I have a couple of mini charm packs, but I’ve never used one. I have SO MANY scrap squares to use up that I think for the time being a mini charm pack would be used to add extra color. Love the book though!! I do not have any mini charm packs but I have a lot of fat quarters and oh so many scraps! Plus I love scrap quilts also. I have less than 5. I like them but I have so much fabric, I am trying to use up what I’ve got. I only have 12 at the moment, but these patterns TOTALLY inspire me to get more to make the quilts you show!!!! No mini charm packs here. But boy those quilts look fun! I’ll have to look for some or better yet see what I have in my stash. It would be great to win this book! I am in the 1-5 category. This would be a fun way to use them. Thanks for the idea! I am a fat quarter and yardage gal, but ready to try something new. "Oh Scrap!" I LOVE that name and most especially the exclamation mark! I have never worked with mini charms before. I do have a few charm packs and a jelly roll on hand though.. So: headed to the quilt shop right now! I really appreciated reading Karen’s words of advice. I once did a quilt with a bundle of fabrics from one line… and I can say definitively… I certainly should have used several differing lines of fabric – it would have made for a more interesting quilt! I have many 2 1/2″ squares. No mini charm packs. No minis in my collection. Lots of other fabric though. I have between 6 and 10 mini charm packs, but don’t really know how to use them in a project. Not a single mini charm pack, but stopping at a new quilt shop today and might just have to purchase several. Although I only have 6, these fabrics and patterns inspire me to go buy more to make the quilts in the book! I have no mini charms in my stash so it would be great to win some. Love scrap quilts. I started my own mini quilt collection a few years ago. I keep adding to it by making more mini squares. What would be nice is to have several squares from one fabric line. Oh that would be sweet. Love your site, go to it all the time. No minis here. Lots of other fabric though. At this very moment, I only have four mini-charm packs. If you’re buying fabric online, they are the least expensive way to get a peek at a whole fabric collection, so I love them. I sort of use them as my catalog to order yardage. And you have the bonus of being able to use them for a project later on. Plus Marks the Spot is the perfect project for mini-charms! I have less than 5, but tons of scraps! Definitely more than 10 mini charm packs reside at my house! I’m always adding one or two when I visit a quilt shop. More than 10 along with a huge tub of scraps! I think I have 3. I do have regular charms I could cut up in a pinch. I have five packs of mini charms, but also a baggie full of squares I have cut myself that were left over from previous projects. I only have a couple but after seeing these projects, I need to buy more! I only have 1 mini charm pack, but several 5 in charm packs. They’re so much fun and hard to resist ! I have between 6 and 10 mini charm packs. Oh….I have more than 10 and can use some new ideas! Thanks for the chance to win!! I have 6-10 currently, but I could make some my own with all my scraps. I am working on 2 packages right now. They re great! I think I have enough to make a quilt now. Lissa did a wonderful job on this book! I have more than 10, I recently cleaned my sewing room and put all like fabrics together. If I never buy fabric again (like that would ever happen) I have more than enough for my lifetime, with precuts and yardage. Soon I hope to have some time to myself to sew again. Heading for the quilt shop right now! I don’t have any mini charms, I see a shopping trip coming. The book looks like lots of fun. I probably only have 6 packages of mini’s but a lot more charm packs! About 20 oh my! Time to get sewing! I currently have 6 to 10, but could make some of my own with all my scraps. I would have to say 1-5, but also that I’m headed to the shop to grab some more! This does look fun! Thanks for the chance to win, and get new inspiration for my favorite kind of quilts – scrappy! Probably 4, I’ve used parts of some, and have two ordered. Also have a huge bag of 5″ squares from a club I belonged to years ago. The book looks like it has good ideas for using up my mountain of scraps. at least 6 – 10 but then the charms and jellies! I have several charm packs,but I have never even heard of mini charm packs. Guess I need to get some because your quilt is so happy! I’m in the 1-5 category. Need to start looking at them differently after seeing these cute quilts. I don’t have any mini’s in my stash although I do have every other size of precuts. This book sounds great….thanks for the chance to win it! WAYYYYYYY more than 10. I was in a "candy charm pack" phase. I think I need her book. Headed to the quilt shop right now! I have no mini charm packs in my stash…yet. I have more than 10 in my stash .. they come in really handy for scrappy quilts ! So far just sew quilt tops for two local charity groups and am now wanting to start on my own quilts. IF I were to win this itnwould be a lovely way to jump on the band wagon! I don’t have even one official mini charm pack, but I do have a plastic storage container full of mini charms I made from scraps. i don’t have mini charm pre packs but i cut my scraps into 2.5″ squares for storage and have tons of those. I have several – between 5 and 12 somewhere – not home where I can look. I use them mostly for hexies! Actually I have 4. I have sewn the others, but I could have many more if I cut my own scraps to that size. Thanks for the opportunity. one or two -but a whole big deep bin of 2.5″ scrap squares awaits. I am in the 1 to 5 group. They are harder to find in the quilt stores around me. I do not have any right now, but I could make up tons of them with the scraps I have. I don’t have any mini charm packs. I do cut all of my left over scraps into squares ranging in size from 1 1/2 inches up to 10 inches. I love to pick a size and make scrap quilts! They are very addicting!! Thank you. None. But I have a large bin of 2-1/2” squares just waiting to become a quilt! Though I have been tempted by those little squares, I have not brought any home since I have soooo many pieces left from projects. This post has given me permission and I am going to store soon to give myself a small present! Thanks for the opportunity to get this book and fabric. I believe I have 4 mini charm packs but no idea what to make with them. They are adorable, though! I have more than 10 packages of charm squares. I love to have samples of an entire collection and charm squares are affordable. Often I will then buy yardage of certain fabrics. Especially in the reproduction lines! I love scrap quilts! And I’d love to own OH SCRAP! 1 to 5 with some that I have cut from left overs of other quilts. It is nice to have them pre-cut. I think there are 8 in my stash and I’ m going to try to get going tonight on the quilt in the e-mail but I’ll have to stop to get some background fabric. I have 3 charm packs. I have been looking at this book and love it. The quilts are adorable. I really like the one with the squares on point. The white sets the quilt off. How fun it would be, to be a winner. Either way I want to add this book to my library. I only have one, but I have lots of scraps and 5” packs that could be cut the size of the mini charms. I have 4 packages of charm squares. I love the look of this quilt and hope to be able to make it once I acquire the white fabric! I’m sure there’s 8 packs plus all the ones I cut from leftover projects. I don’t have any mini charm packs but do have plenty of 2-1/2 inch squares that I work with. I have about 6 Mini’s and keep looking at them and trying to decide what to do with them. Bingo, you gave me ideas. I would love to win that book. I have 1 to 5. I like this quilt! Thank you the the chance to win this book. It looks terrific. I have 1-5. I live part time in two different houses. Can you imagine – having to "create" a stash in two different places?! Oh, the possibilities! Oh, the sadness when what you thought was in the closet is actually at the other house!!!!!!! Must go to the fabric store and stock up on more! I haven’t used mini charm packs but have lots of scraps. I counted 3 charm packs but no mini charm packs. I do love scrappy quilts. I have more than 10. But I don’t go out of my way to buy them at this time. I have gotten them as prizes and gifts. And I bought 6 of the same one to do a project. They’re so cute, how can you resist, plus they don’t take up much space….I love scrappy quilts, but haven’t really made one yet. I am kinda a control freak, and it’s hard for me to get out of that box. more than 10 for sure! Zero. I should make my own from my scraps. I have 2 charm packs, plus jelly rolls, plus oodles of scraps, yardage, fat quarters, etc! Now I just need time to sew projects with all of them! I only have 4 right now. I’ve been using them for English paper piecing. They are the perfect size for the 1″ hexies. Love scrap quilts, have five inch squares but no two’s. Church group is doing scrap quilts for charity, would love to win! I have 1 (1-5) charm pack I bought years ago and never knew what to do with it. I only have 2-3 charm packs currently. I love the scrappy quilts. Probably between 5 and 10 at the moment. So much fun to have a little touch of variety in a quilt! I have too many to count! I keep buying them and then never doing anything with them! LOL! I would be in the 1 – 5 category but I have plenty of fabric in my stash to make more mini squares! + 10….. This book looks like great inspiration for dipping into my stash. Thanks for the give-away! Only a few mini charms, but I have a whole drawer of the 5” ones. Headed to the shop right now! I have a bin of 2 1/2″ squares from past projects, but a fresh start would be great! I have 1 charm pack in my possession right now. I usually cut my leftovers from other projects into 2.5 squares to always have that size on hand for scrappy quilts. I have been looking at this book and thinking it needs to be added to my personal library. 1-5, but lots of scraps! I only have 3 mini charms right now…but could be persuaded to collect more! I think there a maybe 2 charm packs in my stash. But I have lots of scraps that can be made into charm squares and make a really nice scrappy quilt. I am a beginner and have no mini charm packs. Honestly, I didn’t know that they were even available but I would love to work with them. I have several not to mention all the sqs. of different sizes grouped and ready to go. I would love to have this book for ideas to use these charms. I haven’t tried the mini charm packs, yet. This post is inspiring! I will have to try some soon! I only have a couple. They were, more or less, little souvenirs on trips I took. Haven’t used yet, but think I’ll make little "ditty" bags. I have one mini charm pack and I’ve used some of 3-4 charm packs. So a scappy quilt would be great. Really cute patterns. I have only bought one mini charm pack, and I used it right away. It was a fun project, though. I have 2 charm packs and a closet full of quilting fabric from past projects and for future ones. Never enough time. I was worried about all these scraps but this book will be an inspiration. I already feel it helping !!! I have two charm packs in my stash. I would probably make more with my assortment of scraps that I have on hand, but could use more. I have 4 mini charm packs right now. Have been cutting additional charms from scraps but wasn’t sure what to do with them. Love the nine patch! I love this book–however, I have stopped buying fabric. Really, I have. It’s time for me to get a grip and use from my stash. That doesn’t mean I can’t cut it up and make my own charm packs. 1-5. I’m a big fan of layer cakes.I can cut them to charm pack or mini charm packs. I have only 7 mini charm packs and they are so pretty, I’m afraid to use them….crazy, right? Just one! And what a great book to inspire me! I don’t have any mini charm packs in my stash. It’s not that I absolutely wouldn’t love to have some, it’s just that I didn’t see the need. Well, that sure changed this morning. How fresh and delightful it was reading this morning’s Martingale email. The quilts are just yummy and now I can see the need. I have 0 mini charm packs, but a drawer stuffed with 2 1/2″ squares separated by color. We live in our RV so I had to use my space wisely. So I cut a lot of my fabric up I to squares. Needless to say I probably have at least 500 squares. The book sounds like it has a lot of good projects, and the fabric is beautiful. So thanks for the opportunity to win it. Too many to count! I keep buying them and then never making anything with them! I need to start using them, that’s for sure! I have about 8 mini charm packs and well over 12 charm packs. I really need this book to get me going! Thanks for the opportunity. I have over 10……get as gifts usually. I bought six of same for a project. Haven’t used any ye. Love scrappy quilts, but have so much fabric, I haven’t done a scrappy one yet. I have about 15 mini-charms that I have purchased to match or contrast jelly rolls. I plan to use them between strips or in borders. The book definitely looks of interest. 4. I find the little 2.5 bites helpful but really love my yardage. Scraps rule and all my scraps end up being used in time. None! – Need to head to the quilt store!! I have 5 charm packs ready to go. Would love to have this book. This quilt is adorable! I probably have 1-5 charm packs. I tend to use leftover scraps to make quilts but after seeing this book I may have to head to the quilt shop for charm packs. Thanks for the chance to win!! I have at least 20 mini-charm packs that I can lay my hands on right now and probably a few that have migrated from the box I store them in. I have about 10. LOVE LOVE LOVE THIS BOOK. I’ll be cutting some of my jelly rolls down to "candy’s" to make these. I hope I win, I hope I win, I hope I win. 1 – 5 but I have many 2 1/2 inch scraps to use up. I have 2. Good long weekend to go buy more and craft up a lovely scrappy quilt! to quilt store to get more! I have about 6 mini charm packs and well over 12 charm packs. This also doesn’t include my jelly rolls and layer cakes. This book is what I need to give me the inspiration to get going and use them up! Thanks for the opportunity. Is it bad that I don’t even know, there are so many? I’m going to have to go with more than 10. I have about 5 different charm packs but have not worked with mini-charms. Anxious to try the new experience. Am in the 1 to five group. Would enjoy the ease of using these little treasures when making baby quilts and small mats. The book is a great starting point for using these coordinated fabrics. I just have two mini charm packs at the moment. I’ve always enjoyed Lissa’s quilts, and this book looks terrific. I’ve got lots of scrap fabric but would love the ease of using minicharm packs– I dont have any at this time. The cover page quilt is so summery….. just right to cover up with for Fourth of July fun ! I think I have 7 or 8 mini charm packs in my stash–they make great little gifts to friends too! Lissa’s book looks wonderful! I have one charm pack. This book sounds wonderful! I love scrap quilts–they make me feel like I am really cleaning out my stash. ADOREABLE !!! I have 5 charm packs and was looking for an inspiration !!! Stops Abuse where family leave with just the clothing on their backs. These charm quilts are perfect for a child to cuddle with. Thanks for all your positive designs for us…quilters of the world. I have 1 mini charm pack. I’m not sure how or why I have it. I only have one charm pack and I received that as a door prize. I never gave much thought to using it until I saw the lovely quilts in the book. It looks like fun and it has given me some incentive. More than 10. I have this book and love this pattern. Going to look at my packs when I get home for sure. With all my tons of fabric – can you believe, cause I cannot – that I have NO CHARM PACKS!!!!! Would love to try the Oh Scrap ideas….. I have 1-5 mini charm packs in my stash right now. I’m saving them for just the right pattern, which I might find in this great looking book! My category isn’t listed …. I am and a less than 1 to 5; that means in all my 100’s of yards of fabric I have ZERO mini charm packs. I have oodles of other pre-cuts, but no minis. OH SCRAP! has opened my eyes to a new and yet un-trod avenue of creativity without effort or restraint. Need to mini shop soon! I have 4 charm packs and want to collect more!! I’ve been wanting this lovely book since I first saw it. Winning this lovely prize would be thrilling for this quilter! I don’t have any mini charm packs, I usually cut my own from scraps. I have 1-5 charm packs in my stash right now. I’m saving them for the perfect pattern, which I might find in this great looking book! None, but I have lots I have cut from my scraps. Love the fresh bright colors so popular now. I have 3 waiting for projects in my stash. These ideas were cute! I have more than 10 – they are so much fun! Love how your quilt turned out. What a great book! I don’t have any mini-charm packs, but probably two dozen 5″ charm packs which could be cut into mini-charms. Really would love to win Lissa’s new book because I have oodles of scraps which are the right size. "Headed to the quilt store right now!" Omg – or else I will randomly cut my own charm packs from my private quilt store…ahem! I, too, love scrap quilts! I have two whole ones and a partial one right now. Charms are great. I have 3 in my stash. They are nice to have on hand with some backgrouund fabric a quilt can be quickly made. I have one mini and less than 10 charm packs. I tend to buy yardage unless I have a specific use for the charm. I’m in the 1-5 category, but I do have a large bin of 2½" squares that I have cut from other projects! I don’t have any mini charm packs, but do have scraps. I have 4 mini charm packs right now and would love more! This quilt and lovely book would be an awesome win!! I recently started quilting and am enjoying an addiction to fabric-all kinds all sizes-especially precuts! Definitely more than 10 sets! SO addictive! I don’t have any purchased charm packs but I do have a huge bag of precut charm sized squares that I bought at a sale last weekend! They would be perfect for the projects in this book!! Actually just one and it’s a Halloween one. I have a mini 1 1/2″ sqs. and a 2 1/2″ pack, and a charm pack. I love working with scraps because I love the scrappy look in a quilt. I have many more than ten and am usually at a loss to know how to use them. This would be a great gift to win. Thank you. I have 5 charm packs right now and 4 bins of scraps. I Love doing scrap quilts. Now getting ready to do all 7 of my grandchildren their own quilts. I would be honored to win this book. Love, love, love! This book and fabric would be a thrill to win. I have 4 mini charm packs right now and would love more!! I have 12 in my stash right now…no specific plans for them but I couldn’t resist!!! "Heading to the quilt store right now!" Or maybe I ought to cut my own from my own private quilt store…ahem!! I, too, love scrap quilts! Zero – but have lots of 2-1/2 strips ready to be cut and 2-1/2 inch squares. Love these new ideas! I have one mini charm pack in my stash – just waiting for me to decide what to make with it. This book would provide some ideas and inspiration. Thanks for sharing this. 5 – 10, but I’m stuck with what to do with them. Looks like this book will help! I have 2 Charm packs and this has given me a great idea. Lovely prize. I have 3 mini-charm packs in my stash. 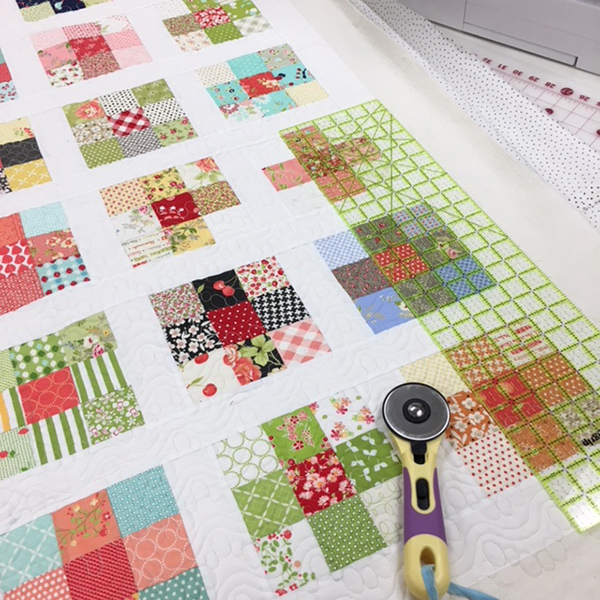 Ozzie Squared is a cute quilt…the colors in Lissa ‘s quilt are refreshing. Thanks for the giveaway. I have 4 charm packs and would be thrilled to win this lovely book and fabric! I know I’ve only 1 mini charm pack as it was a gift from a friend. More than 10. I put them in a candy dish and look at my eye candy from time to time. It’s tucked in a drawer to keep it clean. Love the minis. This book looks wonderful. I have more than 10 charm packs and am usually at a loss on how to use them. This would be a great gift to win. Thank you. I’m headed to the quilt store right now! I do not currently have any mini charm packs as I used them. But I do have a huge drawer of mini charms I cut from scraps in all colors, and am anxious to use them. I love using my scraps in all sizes to make quilts. Don’t have any mini charm squares except for the ones I cut from 5″ charms. Having minis would save time. I have 7 mini charm packs, all given to me when I purchased fabric, you have now given me ideas to use up my packs, I also like collecting them too.This book looks amazing! Would love to own it! I thinks it’s 2 and both are different. What a great idea and outlook. It’s a great way to use not only mini charms but small stash pieces. Thanks! I have about 10 mini charm packs in my drawer at the moment. I love the look and am planning to make a tote out of them in the near future. I am in the 1 to 5 category. I would love to try the quilts in this lovely book! I don’t have any, however, I could make tons of them. They are hard to find in the quilt shops. Love the book….such HAPPY quilts!! 1-6. A girlfriend made a big bear paw quilt with just the minis, and I love it! I have 10 mini charms in my stash love them all!! I only have 2 but I have tons of scraps and 2 1/2″ strips waiting to be used! Always feel guilty when buying yet more material. Have sóóó many scraps. But I just LOVE scrap quilts. I have some in AZ and in AB. I’m pretty sure it all adds up to more than 10! Probably that many Bali pops too. Yikes!!! I do have a plan for 4 of them. Need help for the rest. I have 2 mini charmpacks, which were given to me. I would love a chance to win the book. Mini charms are new in my stash. Great book to get me started sewing! I only have 2 but lot’s of scraps and 2 1/2″ strips waiting to be made into a quilt! 1 to 5 .. but I do have a LOT of jelly rolls, layer cakes, charm packs that could easily but cut accordingly. The book looks like fun! I have more than ten at the current time. They are so affordable and fun to collect and use. They are wonderful for scrap quilts. I am heading to the store right now. Love the ideas in that book but too many quilts on the sewing table and budget restraints. But, a charm pack or 2 wouldn’t hurt. I have hundreds of charm square packs in my stash. All too pretty to use with out a very special pattern. Love this book and hope I win. I have a couple because I usually cut squares I need from scraps from leftovers from quilts as I need them. I love the book, beautiful quilts! 4 mini charms and lots of scraps! 1 to 5 – but I definitely need to rectify this!! I myself have been using fat quarters and remnant scraps but now its mini scrap time. So ill be cutting up some pieces on my AccuQuilt GO and go from there. Yours has good design and balance and color I will definitely try to match this,but prefer to win the book and mini’s. I have a couple mini charms I my stash! I have 5 mini and 2 regular charm packs now. I love these precuts because you get to have a little piece of the entire fabric collection. I would love to make these quilts! I have 3 or 4 mini charm packs. Love the idea of using them for this quilt. Thanks ! A 12 pound container full. I keep giving them away but they keep multiplying. I have more than 10. They are a great way to try a pattern to see how that fabric group works without purchasing yardage. I have just a few mini-charm packs. I have 2 now, and have ordered two more. I used one set for the front pocket of a denim tote bag; it turned out so cute! Thanks for the give-away. I only have one mini, but quite a few 5″ charms. I’d only have to cut those in quarters and have lots more to play with! The book would sure get me started. I have about 4 charm packs in my quilt, now I need the book,lol!! I think I have two small precuts. I just did not know what to do with them. They were a spontaneous buy. I have more than 10 mini-charm packs . I only have one or two. I seriously need to go shopping for more. So many but would love to win the book & fabric. I’d say 1 to 5 charm packs are in my stash right now. Haven’t ever used one for a quilt yet. 1-5 are currently in my collection of fabrics. They are great to get a taste of a line. I have five packs on hand. I always like to ready to go when a new pattern comes along. Looks like I will be beginning soon. More than 10! I am addicted! I’ve never used charm packs before. Would love to win and give them a try! I’m in the 1 to 5 category, with plenty of other stash scraps to fill in. This book is so inspiring. Thank you! No more left, so it’s time to head to the shop! I have 3 mini charm packs ready for a baby quilt. I have not used charm packs yet, but on my list of things to try! I don’t have any. Actually I have few pre-cuts. So many that I cannot count. I collect them when I am in the shop, on line, or see them. I need this book. I have have 4 mini-charm packs in my stash and 2 shoe boxes full of scraps I’ve cut from other projects. I have about 4 mini charm packs and have been looking for a way to use them. I have too many to count. I buy them either in the shop or on-line. I really need this book to get thru my stash. I have more than 10 mini charm packs in my stash right now. They are hard to resist. No minis but I have tons of scraps and lots cut to that size. I have probably six. I use these often when I am making table runners or scarfs. I don’t have the precut mini charm packs but I have a bin full of 2 1/2 squares that I have cut from fabrics leftover from quilts that I have made. I don’t have any mini charm packs–only regular charm packs. I have 4 at the moment! The come and go, lol! I have only 1 mini charm packs in my stash at the moment but I have a few 5” charm packs that I could cut up for minis!! I have 4 or 5 that I can think of now but they are so cute that I may have a few most stashed away! Working with scraps and small pieces is one of my favorite things. This book looks like lots of fun. No mini charm packs on hand, but I do have regular charm packs. Ihave two Moda mini-charm packs and a large shoebox with a couple of thousand 2 1/2 inch squares I cut myself. Oh Scrap! I only have one! Love this idea! Need to go shopping! I’m in the 1 to 5 range. Haven’t quite figured out how best to use them. I have no minis right now, but plenty of fabric scraps that could could used. Or I may just head to my local quilt shop. I’m inspired! I think I may have one mini charm pack in my stash. I have two waiting to sewn into a table runner, but I have used them often in the past. I have 1-5 mini charm packs in my stash plus some of my scraps are already cut into 2.5″ squares. I try to cut my scraps into a some standard sizes after each project. I dont have any, I wish I did! SO cute and fun! Currently I have way tooo many. I am at 8 I believe! : ) But they inspire me to keep up the creating, so many fun colors and prints. I have four packages of minicharm packs now–but I know I will buy more! There are 6-10 mini charm packs in my stash. I’ve been itching to make something with a couple of packs that are dots and I think these quilts would be perfect for them! Thanks for the opportunity to win. My mini charms are in the 1 – 5 category since I have plenty of scraps cut & to cut into 2.5in squares. None. 🙁 But boy is that going to change!! I have 4 waiting for some attention! I have many more precut to 2.5” squares cut from leftover fabric. I’ hope to win this fun book! I have zero in my stash but would love to give them a try. This book looks very interesting! I only have 2 mini charm packs that I can think of. Of course, there could be a few more squirreled away somewhere. Now I’ll have to go look!! I like to purchase fat quarters or yardage and cut my own 2.5″ squares. 6-10 charm packs are squirreled away in my stash. They’re addictive – one can’t buy just one pack! They’re so darn cute and pretty. I need to use them (so I can buy more), so I’d love to win this book! I have more than 10 charm packs, it’s so easy to take home these cute little sets. I have recently found that the precut packs are the best way to go scrappy if you aren’t a seasoned enough quilter to have accumulated the scraps. I’m in the 1-5 category but I can cut my jelly rolls scraps into mini charms. Love the book. I have about 6 to 10 minis because I usually like to cut my own 21/2 inch squares from my scraps. This looks like a great book to use up scraps or minis. Thanks for the giveaway. I have a few mini charm packs, in the 1 – 5 range. But jelly rolls are another matter all together. I have just 2 mini charm packs at the moment but I have used them and really love them. Would love to win this book and mini charms. Looks really inspiring! No mini charms but lots of regular charms and there’s always more to try! This looks like such fun! I can’t wait to give my granddaughters a couple of my mini packs and see what they come up with. I have 4 or 5 but I also have a stash of 2 1/2 in. squares made from leftovers. In addition I have many scraps in my stash as I don’t like to throw any fabric away!! I have 6-10 in my stash right now. This is an awesome book! Oh wow!!! A couple dozen at least! I could really really use this book to get them used up…then I can buy more!!! I love pre-cuts… I current have in excess of 25 charm pack. None ( yet) but I am inspired by this book. I do have baskets of scraps. i have 5 charm packs right now. because i gave away a few not long ago…but this is a great quilt! and i can see how addictive it could become. I’ve never purchased mini charm packs, but I’ve cut lots of mini squares. I have to be honest, NONE! but I LOVE this idea……yes I’ll be looking for these charm packs and give it a try…lots of jelly rolls. I love pre-cuts. I have in excess of 25 charm packs. I think I have 2 or 3 minis. Bag full of regular charm packs! But tons of scraps, too! I have NO mini-charms on hand, as I do scrappy and cut my own when I need them. I do use them frequently. I don’t have any mini-charm packs that I bought, but I do have some that I cut when I was finished with my Christmas sewing for my family. I plan to use them to make quilts with them in the future. 6-10 and I really need some inspiration to use them. Certainly more than 10 – probably a couple dozen!! I need this book to use them up, so then I have an excuse to buy more!!! I love the quilts in this book. I have many scraps, but no mini sets. I have 1-5 at present and a couple of jelly rolls and layer cakes. I use them a lot for variety in scrap quilts and to trade with friends. Mini charms were the best thing that ever happened to my pocket book. Zero! But I also have a bin full of mini charm pack sized scraps left over from a variety of quilts and other sewing projects. 1-5! I just made a fun summer bag with a couple of sets. I loved working with them. Thanks for the chance! I have 6-10 mini charm oaks, but dozens of the 5 inch that can easily be cut! I don’t have any mini-charm packs, but boy do I have the scraps. AND lots of 2 1/2 inch squares already cut. Headed for the quilt shop today! I have a shoe box with 2 1/2 inch squares cut but it is hard to find things that coordinate. I love nine patch blocks. Thanks for the wonderful tip! I have less than three right now, but there will be more to come! I’m heading to quilt store now. I have yet to use mini charms, but this book is very motivating. I mostly have regular charms, but am tempted to start cutting some of them into mini charms. I do not have any. Just started quilting. Would love to win. I have 2 with matching jelly roll. I have 6-8, all different designers. I love these charms! Can’t resist buying them. I, too, have a stash of scraps…but seems I rarely use them….just always sway to new. I have less than three right now. I have a few ones of small scrapes, this would be perfect. 1 to 5 — because I have used all the ones I bought! I first used them to make a mondo bag — so much easier than cutting up all those squares. They’re good for all kinds of things, and I love these ideas. I only have 2 or 3 mini charm packs but loads of regular charm packs and even more scraps. This could keep me busy for a very long time! I’m on the way to the quilt store now. I haven’t used mini charms but this book is very motivating. I mostly have regular lots of regular charms but am not tempted to start cutting them into mini charms. I don’t have any. I have jelly rolls and charm packs. I guess I never noticed them! How clever (and freeing) this pattern is, too! Like many others, I have a bin of 2.5″ charms – cut down from scraps as I’m cutting for other projects. I also have a bin of strips (some jelly rolls, some cut down from my stash), so I’m good to go. Scrap quilting is my forte!! I have 6-10 mini charms in my stash. Love scrappy quilts. If you don’t have mini charms, its loads of fun to add “free” scraps from my stash. I’d love the O Scraps! book to add to my repertoire of scrappy patterns! I am in the 6-10 mini charm range – love these. They are so cute! 11 what a fun number right? Headed to the quilt shop! I have a couple of mini charm packs that I started a project with as well as some others. However, I also have some charm packs around that could easily be cut up to make my own mini charm packs. I currently have about a dozen charm packs stashed, with quilts planned for only about four of them. Received a mini charm pack as a door prize, but haven’t made it up yet. Need some ideas – and some time. 1-5 and I never figured out what to do with them until now! I have more than 10. I get them so I can see all the fabrics in the line. They make awesome totes and zippered pouches! I have only 4 mini charm packs but a bin full of scraps that I can make 2 1/2 squares. 1-5 but I can see more in my future! I have one mini charm pack that was just to cute to pass up. I have maybe 2 mini charm packs in my stash however many more charm packs that can be cut down. A scrap quilt is definitely on my list. I only have 1 today. I have zero, zip. I cut my scraps into 1 1/2, 1 3/4, 2, 2 1/4,2 1/2, 2 3/4 & so. Largest is 10″ of course that would be 16 minis!! Trying to keep things under control. Then I enjoy.mindless seeing 4 patches! 1-5 and many precuts and fat quarters. Scrap quilts are my favorite. No scraps are too small!! I have several charm packs which I can cut to size allowing me to make a larger sized quilt. Currently have 10 21/2 inch scrap bundles and 3 jelly rolls. This book would be a great place to go for inspiration and ideas! 6-10 for me – doesn’t mean I can’t have more! I only have 2 minis; could use a few more! I don’t have any mini charm packs yet, but your write up and pictures make me want to go right out and get some. Love the quilt you made. I currently have 2 mini-charm packs in my stash at the moment. Oh gosh, many more than 10! LOL! So many more than 10! I’ve been collecting them for many years. I also cut 2 1/2″ squares from scraps and save them. I have at least a dozen mini charm packs! I’ve just started purchasing mini charm packs but I think I have three or four. I would love to win this book as it looks like I could learn a lot from it. I hope to do some quilting over the summer. This has inspired me to get some minis to use for a table runner! Very inspiring ideas to try something new! I love mini charms but I’m fresh out! These quilts are great. I must have between 6 and 10 mini charm packs right now. Love being able to see all the fabrics without buying lots of yardage. Many, many, many! But always need more. I haven’t purchased any charm packs. I create them with my scrapes. 2 1/2 – 4 1\2 inch squares. I am very interested in this book. I can always learn new triks and ways to create scrappy. I only have two or three but seeing these makes me want to get more! I have more than 190 in my stash at the current time. no mini-charm packs, but lots of charms packs, and layer cakes! And yes, a bin full of 2 1/2” squares. I have 6 to 10 mini-charm packs AND bin of 2 1/2 inch pieces. The book looks fun! Thanks. Headed to the quilt shop right now! Sadly, I have none… yet! I’m brand-new to quilting and am looking for inspiration on making my very first scrappy quilt. I think I found it… here! 😃 Thank you for offering this exciting giveaway! I don’t have any mini charms, but lots of 5″ charm packs. I have about 5 mini charm packs….and lots of scraps that can be made into charms! I don’t have any mini charm packs, but I sure have lots of fabric that I could cut into 2 1/2 inch strips and then into squares… I already tend to have 2 1/2 squares cut from scraps, which I make into 9 patches by the Bonnie Hunter Leaders and Enders process, so this book would be useful in making something different with those scraps. Sounds yummy! I’m in the 1 – 5 category. I have 4 mini packs, I am a new quilter.. I have looked at this book online several times and thought about getting it.. a full quilt is quite daunting to me but a mini quilt could be something I could accomplish.. I have neverr purchased a mini pack-lots of charms though. Now I am sold on minis. Zero I don’t have any mini charm packs but would love to get some. I probably have 6-10 charm packs but possible there are more stashed somewhere. Love the quilt she showed on this site. Looking forward to trying some of the ideas in the book. I have ZERO mini charm packs in my collection because I believe a scrap quilt should be made of actual scraps found in my bag of fabric trimmings (not purchased pre-cuts that are co-ordinated). I don’t have any mini charm packs in my stash. I have between 6-10 Mini charm packs. Plus I also have a bin full of 2 1/2 squares that I cut from scraps. 4 that are waiting for a project and I love charm packs. They are great for applique quilting too. I’m forever digging through my scraps. I have 6-7 mini charms in a special box. 6-10mini charm pack and a layer cake. Thank you. Love to make something from this book😊. I have 5. They are just so cute I have to buy them! 1to5 mini charm packs but over 300 2 1/2 cut squares and miles of 2 1/2 strips….this book is on my wish list. I currently have only 2 mini charm packs, but this post has intrigued me. I see the need for more….soon! I have no mini charm packs, but this book has some great projects that could change that. I only have one of the mini charms right now, plus several regular charm packs and a jelly roll, plus a ton and half of scraps. I just used several of the mini charm packs to make baskets for end of the school year teacher gifts, which were very well received. Would love a copy of the book as well as the scrap pack. 🙂 A girl can never have to much fabric! I have only two mini charm packs in my stash. I have so many scrap pieces left over from projects, but never find the time to cut them into useable shapes and sizes. Maybe this gives me permission to let some of it go and buy some charm packs instead. I have over 10 mini charm packs but have also been cutting 2 1/2″ squares from leftovers. Don’t believe in wasting but can you ever have enough fabric???? I have over 10 mini charm packs but have also been cutting 2 1/2″ squares from leftovers. Never know when you may need just one more square. No mini charm packs 🙁 But I could buy some! I have about 5 mini-charms. Haven’t figured out what to use them for, but this book could give a lot of ideas. I’ve been collecting charms for a project I have in mind, but no mini-charms. Not that I don’t have plenty of stash to "charm". I am addicted to scrap quilts and this book looks like one I will need in my quilt book library. I have never purchased a mini charm pack because I usually cut my own 2.5 inch squares when I have a piece of fabric that is too small to do anything else with. I also purchase jelly rolls and cut my squares from those. I have more than 10 and lots of scraps waiting to be cut. Less than 5. Don’t ask about 5″ and 10″ squares, or 2 1/2″ strips, or it might be embarrassing. 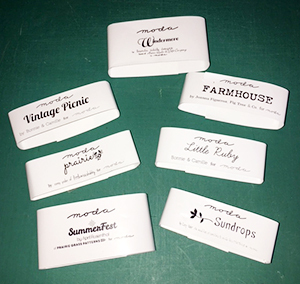 I only have 4 Mini’s & could not decide what to do with them–now I’ve a great idea. Thank you ever so much. I have no charm packs. I do a lot of charity quilts and all shapes and sizes of material is donated for quilting purposes. So, I do quite a bit of scrap quilting. I have more than 10 and lots of scraps ready to be cut. Heading to Quilt Store right now!! I have about six and I’m dying to use them up! This is a great reminder to get going! 1-5! I usually buy fat quarter bundles! More than ten! Sew cute! I currently have 4…..until, the mail comes today, then I’ll have 6, then I use them as fast as I get them making little zipper bags for friends! The great thing is, when I take my rotary cutter to a charm pack or a layer cake or even a jelly roll…SHAZAM! MINI CHARM PACK! I have more than 10 mini charm packs. I love the patterns in this book! Collecting Minis and Charms has helped me to make many fun and quick quilts, for family, friends, and myself. They are so versatile, and make such appreciated gifts! This new book looks absolutely wonderful! I actually don’t have any, I’ve never bought one but think I will have to now! I have 5-6 mini’s, which I have been holding onto. I looked at the post then went on to another site and came back, because the colors spell happiness. No coordinated pre-cuts, but perhaps 200 squares waiting for a project. I have 4 charm packs. I am a fairly new quilter of maybe 6 months and now I’m hooked! I have four mini charm packs plus a box of 2 1/2″ squares that I cut ready to go. At least 5 or 6. Maybe they will be headed to a quilt in the next year or so…one can hope! None yet but I’ll try them. I have a whole room full of fabric though. Mini charms are so cute! I have somewhere between 6 to 10….but wish I had a lot more! I adore your quilt, Karen! I would say that I am in the 1-5 category. However, I do also have a stack of 5″ squares that I have cut from my scraps. O now. I love charm packs for the variety of coordinated fabrics but have found in 5’by 5″ charm packs more than half were smaller than 5 by 5. In my last charm pack quilt I found the blocks were not fitting together. I ended up re-cutting all the squares to 4.75″ by 4.75″. I think I have about 5 right now ! I would love to win this book!! I have at least 5 packages to use. Can’t wait to read this book and get a start on my stash! I have more than 10 and would love to own this book. I have used larger charm packets in the past but must admit I have no minis. Will remedy this this weekend when I go shopping for Memorial Day sales/specials! More than 10…maybe even more than 20! I have no precut mini charm packs. But apparently I need some! Hi, I love this quilt pattern. I have lots of 2-1/2 inch material. I have so many grandchildren and great grandchildren that making quilts is my passion for Christmas gifts for them. I would just love to have this book to help me find quilt patterns to include for them this Christmas. You know those big plastic barrels from the grocery store filled with (very) orange cheese balls? Kinda like Cheetos but round so they roll around and get smears of greasy orange everywhere? I re-purposed the barrel and have it filled to the brim with mini charm packs. It looks like a cookie jar, only filled with delicious and colorful charms! There’s at least a baker’s dozen in there…times three! None that I have bought, but I keep organized scraps from 2″ to 6″ for scrap quilts. I have 3 packs. Plus a bunch of 2 1/2″ squares from old projects. I love them for smaller projects or adding a sur[rise block in a large project. I have six. So pretty. Now I have a good idea how to use them. Have looked at Oh Scrap many times and almost ordered it. Love quilt books and this looked like a good one. Headed to the quilt shop ! I have about 40 charm packs, but no mini charm packs. I have less than 10. Currently "zero" mini charms but would love to give it a spin!!! I have about eight, just waiting for a project! Right now I only have a few min charm packs. But I have many more regular charm packs and “oh so many” scraps. Would love to win the book and have some new ideas. I have no mini charm packs currently but I must admit I’m intrigued! I have between 1 and 5. I like using them to make small miniature quilts. I think I have one somewhere. I usually buy yardage and sometimes fat quarters. I honestly don’t have any. But after reading about Lissa Alexander’s approach to using the mini charm packs- I am all in! 1-5 for me. I don’t buy them. They just appear???? Although I have several charm packs and jelly rolls, I have not one mini charm pack. After reading this post, however, this will change! Thank you for the chance to win. Just two mini charm packs! I have 5 waiting for some inspiration. Would love to win. I have 0 mini charm packs but lots of odds and ends. I have 0 mini charm packs, but lots of odds and ends. I have about half a dozen mini charm packs, but I have a drawers full of precut scraps in various sizes, including 2.5″ squares. I just finished my first quilt top from the book and I can’t wait to start the next one! Thanks. There are not any in my stash right now. I have ordered some and could create some from my large stash. That book and fabric giveaway would get me started. I have 6-10 mini-charm packs just waiting for the right pattern. Thanks for the opportunity to win. I don’t have any but would love to try them. I love the coordinated look of them. I have bins of other scraps that I use all the time. Two mini charm packs with some matching fabric so I can made a table runner. No minis right now, but fat quarters. Hopefully I will have some soon. Alas, I don’t have any mini-scrap packs. Obviously I am greatly in need. I do have lots of scraps that are just begging to be used. I hear them calling out whenever I go into my sewing room, "Use me, please use me!" Oh Scrap would be just what the quilting doctor would order to help me out. Those voices in my head would be calmed right down! All those left over jelly rolls are getting stale waiting to be popped into a fresh project. I always enjoy Lissa Alexander’s quilts. I would enjoy having a copy of her newest book. Thank you for the opportunity! My own sister’s name is Lissa, and with my enjoyment of quilts, a quilt book by Lissa Alexander seems perfect. I havent tried using mini charms yet, but your post was inspirational. I have 5 mini charm packs & lots of scraps, I love the scrappy look!! I think I have six stashed away for a "special" project yet to be determined. I got it from a fabric company at a quilt show. I haven’t seen the minicharms for sale. I do not have any mini charm packs but could make some from my stash. The book and fabric giveaway have inspired me. I have 0, so guess I better head to the fabric store! I probably have between 6-10 mini charm packs. I was amazed to learn I have 13 mini charm packs, so I NEED your book sew much…lol! Love the Plus Marks the Spot pattern…it may be next on my list to attempt over a busy summer. I mean seriously who could ever stop sewing in any season, right? Thank you for the giveaway opportunity! No mini packs at this time, but I have a tub full of ones I have cut from scraps. I have 6 or 8 mini charm packs — only 2 of the same line. They’e so cute. I tend to buy ones that are sitting on the counter at my LQS. As tempting as candy but no calories! I have 3 mini charm packs at the moment. I have over 15 charm packets. I am buying them for samples of fabric lines. Making a quilt out them is a great idea. I don’t have any mini charm packs right now, but I do have several jelly rolls. I only have one mini charm pack! I don’t use charm packs but have oodles of scraps to work with. The book looks like lots of fun. I have maybe 2 or 3 because I stash them in quilts all the time 🙂 they are adorable! Way more than ten!…I am addicted😬😉! I can’t even find all of the charm packs that I’ve bought over the years! So, yes, more than 10! More than 10. Mostly 5″ X 5″ but I can cut them down in 1/2 and get more. 6 to 10 would be perfect for my project. I have never had a mini charm before. I love scraps, I love this book, and even though I have probably more than 10 mini charm packs and have roomfulls of fabric… I would love to have this sampler fabric. I don’t have any mini-charms yet. I have been a little tentative about working with such small pieces. I have 1-5 right now. Probably 1 to 5 in my stash. I have more than 10 I like using them in my quilting. A week from today is my 69th birthday, this would make a great gift. Thank you for the opportunity. 1-5, The ideas are great. Wish I had more but I only have 1. I’m a beginner quilter and tend to go with smaller projects. (I’m intimidated by my first quilt—a small lap quilt that is ready to be quilted! ). This pattern looks fun and I’m sure the book has other addicting patterns. Thanks for the chance at the giveaway! I only have 3 mini’s but I’ll better would look great with all my 5″ Charles too! I have 1-5 mini charm packs. I would love to win! Thank you! I have several charm packs and 10″ squares and a jelly roll in my stash. I am just getting into quilting and needed to start somewhere so bought a few that called to me. However now that I go online to shop more and more call to me and I need to put on the brakes. I would love the opportunity to see what I can do with the fabric and book giveaway. I only have about 6-10. I only have a partial one right now. It’s the leftovers from a previous project. They are fun. I used them as the ‘chain’ in an Irish chain I did around Dresden Plates. Love the scrappy look. I have two mini charm packs! I don’t have any, yet, but I love scrappy quilts! Thanks for the opportunity to win a great introduction to them! I only have one mini charm pack. I do love them but wonder what to do with them. I need this book! I think I have two mini-charm packs right now. Perfectly willing to go get more though, to make all the beautiful quilts in this book!! Thanks for the give-away. I have over 5. They are very addicting! More than ten, they are so cute and fun to use. Love that your giving away scraps. Been using a lot of them with my quilting buddy on a pineapple block quilt. I have just one and a half left from a project. I have 6 or 8 mini charms, and would to use them, and would love to own this great book, thanks for the great giveaway. I’d guess 1-5. I love scrappy quilts. I have 4 mini charm packs currently. I have lots of scraps that need to be used. I have somewhere between 1 – 5 mini charm packs, and that’s where they are,, too–somewhere in my stash! So many more than 10 that I’m a little embarrassed! I think I have 3 mini charm packs. I have a lot (more than 10) of standard charm packs. I’m headed to the quilt shop right away! Way more than 10! I love working with them! I don’t have any mini charm packs but I can quickly cut scraps into those cute little squares that are sew perfect for scrap busting. I have 6 charm packs right now, but no mini charm packs. Snip, snip and I’ll have a pile of them! I currently have 4 mini charm packs, but one is a Fasset that had 150 charms. I have used some of them already. I only have a couple of mini charms, since my philosophy is more fabric is better! Lissa Alexander, and it would be fun to play with her scraps too. I don’t have any mini charm packs. I really didn’t know how to use them, but now I have a better idea! I don’t have any mini charm packs but I do have more than 10 charm packs in my stash. Thanks for the giveaway ! I have none. I must get some! I am buried in a K Fasset sea of beautiful fabrics at the moment. I have 0 mini-charms, but quite a few charm packs. I can’t wait to cut them up and make a scrappy quilt. What a freeing idea! I get tired of cutting all those little 2 1/2 inch squares. I’m on my way to the quilt store to see what the have. Keep your fingers crossed! I have three charm packs. I have not used the 2 1/2 inch mini charms though. I need some motivation. I have 3 mini charms. It was just recently that I began to try some of the precuts. I’ve always used fat quarters and yardage in the past. The charms are fun to work with. I have 1 to 5 mini charm packs, but after seeing the lovely quilt Karen made I obviously need more. I love the red centers–red is my favorite color! I have 1-5 mini charms. Good thing you didn’t ask how many charm packs as I’d have to face the reality of TOO MANY!! For sure I have more than 10, did a project for our women’s retreat, I am always heading to a quilt store, for BOM, to look at what’s new, and doing a little online shopping too. I have 0 mini-charm packs, but quite a few charm packs. I’ll cut them up and make this scrappy quilt. So cute and simple! I have 1-5 mini charm packs. I think I have one mini-charm pack, but about a dozen charm packs, which will cut easily! and then there is the gallon size plastic bag of scraps cut into 2 1/2″ squares………I need this book! I only have a few mini-charm packs. They were all freebies when I purchased other fabrics. I do have dozens of charm packs which I have occasionally used to cut into smaller squares. I have more than 10 – can’t wait to make this project. So fun and cute! I have about 10 right now! Thanks for a chance! Lots and lots of charm packs but have never seen mini packs! I will only admit to having 1 to 5. They are so additive. Your quilt is complete in no time. Thank you so much for this giveaway. Your quilt turned out so pretty, well done! Too many to count!!! And I’m always getting more. I love using them. Thanks for the chance to win. I would have to say 6-10. Plus jelly rolls and layer cakes, and fat quarters, and too much more. And scraps galore. Love it all. Isn’t the collecting a big part of the fun? This book looks really interesting. I have zero charm packs, but so much other fabrics that can morph into many charm packs. At least to 6-10 mini charms plus 3-4 charms and a layer cake or two! Headed to the quilt shop! I’ve never used mini charm packs, but this looks like easy fun! "Headed to the store right now", lol! I could make a ton of them though, from all my extra fabric. Many more than 10. I love them. I have never bought a mini charm pack but I love your idea! Instead of doing all that cutting-Off to my local quilt shop I go to check out their mini charms! I have 11 packs of mini charms packs. Maybe 12…now that I think about it! I have some charm packs too…my first one was in a tin! I could cut more little mini charms. I only have 1 mini charm pack. If I win this package maybe I will figure out how to use more! I don’t have any and I have never tried them, probably because I don’t know exactly how to use them. This blog has been very interesting to me and it is inspiring me to just try and even look into my own mess of scraps. I love scraps because it feels like one is making something out of nothing. I don’t have a single mini charm pack! Just getting into using precuts, but want this bookto start cutting my scraps into sizes for the projects in the book. Then I can start investing in precuts for the book projects, as well. I have a lot of charm packs but somewhere between 1-5 mini charms. I have just two mini charm packs right now. Haven’t been able to find what I want to do with them. I have 4 Mini charm packs in my stash and probably 20 regular charm packs in my stash along with many, many fat quarters. More than 10, especially if I include the partial packs. I think mini charm packs are adorable and fun to use! I don’t have any mini charm packs, but they sound like just the thing for scrappy quilts. It would certainly save a lot of cutting! None! Guess I better head to the quilt store! Thanks for the giveaways! I have lots of charm packs but 1-5 minis. I have 4 mini charm packs right now and can’t wait to use them like you did. Love the pattern! now I’ve a got a few more ideas as to what to do with them!! ;-) thanks! Oh how I wish. I have zero to none mini charm packs and live about 70 miles away from my nearest fabric store (in another state). I do love to play with fabric scraps, however. I LOVE any charm packs or anything that is already coordinated for me. Then I know for sure it will match. I have 5 charm packs that would suit these scrappy projects as well as boxes of sorted and assorted scraps. I only have one that was gifted to me but I have a whole box of 2.5 inch squares that I cut myself that can be used the same way! Yeah! Sadly, I only have 3! I don’t have any mini charm packs in my stash right now so I need to head to the quilt store immediately! Oh my, I’m inspired! Love the random sewing and quick blocks. I’m sure I have a bunch, if I could only find them! I have 6 charm packs and lots of scraps. Love the suggestions and can’t wait to start. Unfortunately I have none. I’ll have to get some,or maybe I’ll just win a pack or two! I have lots of scraps and am trying to cut leftover fabrics into usable sizes as I finish a quilt. But I would love an excuse to go and buy more charm packs! No mini charm packs but LOTS of other precuts that would be easy to cut into mini charms and LOTs an d LOTS of fabric that could be cut up! I only have one but have plenty of scraps, so I could make my own. But it’s always much more fun to work with coordinated charm packs. I have 6 mini’s and 2 micro mini. None thatthat mix and match. I do have scraps though. Unfortunately I have none. I’ll have to get some, or maybe I’ll win a pack or two! I don’t have any charm packs. I cut out squares from my scraps to make my own. I am in the 1 to 5 category an have tons of scraps. Hey, a girl can never have too much fabric!! I have about 23 mini-charms. Love them! Collecting them until I retire this September and then sewing, sewing, sewing. I have eight mini charm packs and have not yet found the Pattern Prince that will charm the Queen Bee into using them. The scrappy book is a sweet temptation. I have at least 10 charm packs so I loved this idea for making the quilts look Scrappy without messing with leftovers. I have too many….but love them all! They just ‘seam’ to multiply on my shelf! I don’t have any charm packs in my stash but I do have a drawer full of 2.5″ squares (as well as drawers with sizes up to 6″ square) cut from my leftovers. I make so many scrap quilts, most of which end up at Lutherdale Ministries (camping ministry) in Elkhorn, WI for their annual quilt auction. I am truly a scrapaholic! I have more than 10! I need this book so I can use them all! 😊 I love all of the quilts I’ve seen so far and there are quite a few I want to make. Thanks for the chance to win a copy. 1-5 mini-charm packs now. Love them, but so trying to sew from my stash! 1-5 plus 1 jelly roll….. I know I have 3 or 4, but they’re so small, I don’t know if I can find them. I may have to buy some more. I do not own any mini charm packs but seeing this book really inspires me to get busy cutting! I love the scrappy look but usually buy larger pieces but this could be the beginning of a new thing for me! Thanks for the chance to win. Love this book! More than 10 for sure!!! The mini charm packs are just so cute! I have between 1 -5 mini charm packs… love this quilt it is super adorable! I want to go make one right now! I have at least 10 mini charm packs, and quite a few 5″ charms and jelly rolls. And a basket of 2″ squares for a leader and ender project. I’m hopeless, LOL! I have between 1-5 mini charm packs. I need to use up all of my scraps first. I have a ton of scraps. I have exactly 6! tks! I have 1-5 mini charms. I tend to buy charm packs which can easily be cut into mini charm size. I also cut mini charms from my left over 2.5 inch strips! I don’t have any mini charm packs but I do have a stash of 2-1/2″ squares. I only have one mini charm pack. Thanks for the opportunity to win this great giveaway !!! I have no charm packs at all, so I need them! 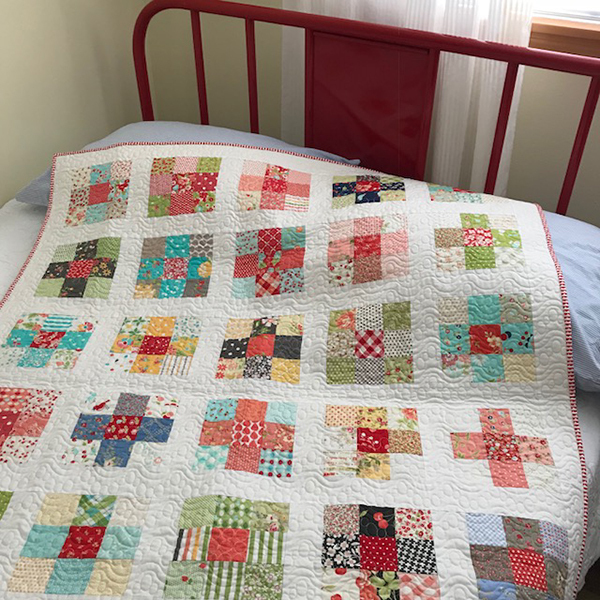 I love this scrappy look and as I age I don’t need any more quilts myself but love making charity quilts for my guild. I have 2 bundles of 5 inch squares just waiting. 8 little minis! But I’ve controlled my weakness! I will buy one every chance I get if I win the book!! More than I like to admit. I could probably get to six different 3 packs right now…lol Love the finished quilt! I have one that I’ve been hunting for a pattern for. Thanks. 1 to 5 (maybe 3). I lean towards jelly rolls, but would be interested in giving some of the patterns a try. Oh my, I have lots of minis! Definitely more than 10. Just can’t resist them. I currently have a plastic sweater box sized container stacked on end two deep full of mini charm packs as well as at least three project bags with several multiples of six mini charm packs. This does not include the two same sized boxes of charm packs. You have given me (another) project idea to use them. Thank you. I have 3 jelly rolls. These type quilts are always my favorite to make. So cute! I don’t have any minis! Sadly I only have one, but a substantial stash. It wouldbe freeing to just be able to "play" with precuts. right now I am in the 1-6 in my stash. I would love to win this I have a quilt retreat in Sept & could use another easy & fun project. More than 10 plus shoe boxes of charm square exchanges from m my quilt guild. I’m working on it, my sister helps me and I help her. I’m always looking for patterns to work with mini charms. Perfect projects for "open day sew" at a local quilt shop. There’s only about 2, there’s lots of jelly rolls and layer cakes which can be cut up sometime! I don’t have any minis but think it would be fun to make one of these quilts. I have 1-5 mini charm packs and would love to recieve this book for inspiration! I know that I only have 5 or 6 charm packs right now. Don’t ask what else is in my stash! 0, but scrap quilts are also my favorite! Why did I never think to use them before…brilliant. I’m always buying fat quarters or fat 8ths, but not next time. I’m in the 1-5 catagory. Looks like fun projects! I have 1-5 minis but my jelly rolls are ready to make more!! I have only 3 mini charms. But many more 10″ layer cakes! I am always looking for interesting ways to use precuts. 1 to 6 mini charm packs. I would love to win this. I have a lot of scraps of 30’s fabric that I want to use. I have at least two charm packs and two jelly rolls that I purchased. I also have a charm template that I keep nearby for cutting charm squares from scraps. I am always willing to welcome new "citizens" to the stash community. I have over 10 packs of mini charm squares! But some of them are doubles…I need to buy more! I would love to win this book. Thanks for the chance. I have 2 mini charm packs in my stash. Both were gifts from swaps. No minis yet. It would be fun to try some quilts with charm squares. I would say I have 1-5 mini charm packs. More accurately, probably 3-4. Thanks for the awesome giveaway! I don’t have any minis’s. But I have a ton of scraps and don’t quite know what to do with them. I have about five charm packs in my stash now. I plan to use them this summer in my sewing. I have none, just started quilting three months ago. I don’t have any mini charm square packs…but have the 5” square packs and 2 1/2 strips that can easily be cut!! More than 10. Many more! I have two packages right now but after reading this blog I’ll be rethinking purchasing some more! No mini’s but lots of scraps. I probably have 6- 10 charm packs – I just love the fabrics that are put together!! First, Karen, your quilt is every bit as beautiful as Lissa’s. I have 5 mini charms which should give me a nice jump start on a quilt. No minis but lots of other fabric. The quilt looks so cute. I have about 6-10. Plus more charm packs and layer cakes! Thank you for the opportunity to win! Have a safe and Happy Memorial weekend! I think I have one that someone gave me. I’ve never known what to do with it so some inspiration would be helpful! Barely squeaking into the 1-5 category . . . opened ones don’t count, right? 5-picked them up ‘cuz they are so cute. I have 6 to 10 and aiming for more! I have two mini charm packs. This looks like a fun book! I don’t have any charm packs – I figure I have so much fabric, there’s no room for even a mini! I just might cut some of it up and pretend. I really need to learn how to use my scraps. I only have between 1 & 5. I tend to buy fat quarters. My local shop has started selling their scraps by the inch, so now I always check that box out for bits and pieces. It has given me lots of scrappy inspiration. I have two at the moment–looks like a fun book! Probably about 5….not a bad start. I am a true scrappy so this looks fun! I don’t have any minis. After reading and seeing your quilt, it’s off to shopping I go. Having my name picked for "Oh! Scrap" would be fantastic. Thank you for your inspirational blog. Definitely more than 10. Which reminds me that I need to get started using them. I don’t have any mini charm packs but i do have a pile of 2.5 inch squares. I own 2 mini charm packs. I never think of them. I love the quilt though. I just might have to use the. I don’t have any mini charm packs, but I have some regular charm packs. I have one charm pack, 2 jelly rolls and a bunch of fat quarters. I only have two, may need to change that if I win the book! I have around 4 or 5 along with lots of scraps so this looks like a book I need. I never saw these before but I do have quite a scrap collection and I love that first quilt you showed. I have 1-5 on hand currently. I’m ready to dive into a fresh endeavor. I have 6 in my stash right now. I’ve only bought one, but have many mini squares I’ve cut myself from scraps. I love the book and know that you could use this for any size square makes it all the more a good purchase for quilters. At present I only have two mini charm packs but when sorting small scraps in my stash I will cut out different size squares so I already have some to add to charm packs. Thank you for the great idea and neat idea on how to use left over white for sashing that I have not done before. Now I have license to make more to create some treasures. 1-5 – the mini-charm pack urge hadn’t hit me – UNTIL NOW 👀. I only have 1-5 mini charm packs, that’s only because they are not as available as other pre-cuts in the local stores. I’m glad you didn’t ask how many charm packs I have!!! One to five but I could find more quickly if I won the contest! I have yet to use any of these but I am going to. Really I am ! as I can’t hoard them forever. !?! I have one in my little stash. I am a beginner at quilting. So my fabrics are few. And I am not sure what to do with the mini I have it is solid cream. I have 2. Now I have inspiration and ideas. Hmmm, I’m guessing it is in the 6-10 range, though sometimes mini-charm packs multiply without my knowing it. I have only 2, but didn’t know what to do with them.This book would definitely solve that problem. None. I’d rather cut my own! I don’t usually purchase charm packs. I think I may have 2 or 3 I have purchased. However in my scrap management, I cut scraps to most usable side which results in a fair number of scraps that are charm size. I keep them in a plastic organizer until they are used. I only have 3 and 2 are the same; have yet decided what to do with them. Would love to have that book in my possession. Thanks for the giveaway. At this moment, Im not sure how many I have. I have just moved into our home and all my fabric is safely stored in countless tote boxes!!! I am having withdrawal symptoms because I cant get into my fabric yet. This fabric is beautiful and makes me so excited to get in my new sewing room!!!! Have a safe, happy Memorial Day!! I seldom buy the mini charms so I have less than 5. I don’t have any purchased mini charm packs, but I do have lots of 2.5″ squares that I have cut from my scraps/stash. I would love to win Lissa’s book–I love her designs and her tips/ideas. I generally cut my own these days, so I have some control over colors. But I have used them in the past to create a four-square block and then a solid block next to it (not sure what to call that pattern). Made life so much easier! I have many multiples of 10. I have many sets of 10, but I find it hard to use them. I have no mini charm packs in my stash. In fact, I’ve never used one! I would love to give them a try! Thanks for sharing this book and for offering the giveaway. 1-5, but I have a ton of scraps that would work great. I have wayyy more than 10 mini charm packs. I think they are so cute. So far, I’ve only used 3 of them for a table runner. I would love to win your book and scraps to add to my stash! Thank you for this opportunity! I have 2 mini Charm packs and that would be enough to start out to assemble them into one of Lissa’s sweet little quilts. Then I will head out to a quilt shop and find more little sweet Charms. I have 15 charm packs and 4 mini charm packs! Would Sew love to win this book and use them! I have six minis right now, with plans for them all. Thanks for thee fun giveaway! I have more than 10. They are hard to pass up. Just 1. But would like more. I have one, but very excited about my one so far!! I have one, but very excited about my one so far!! Waiting for the right pattern. More than 10 and I love them! I have 2 mini charm packs. I have 6 – 10. They are so adorable and addictive. I have probably 9 or 10 right now! and yes, I am a scrap quilter. Thanks for the opportunity to win! I have only one mini charm pack in my stash. But this gives me hope that I can do something with it! I have 7 sets of mini charm packs but have never known what to do with them (other than look at all the pretty fabric). no mini-charm packs, but about 8 regular charm packs waiting for special projects. I currently have three mini-charm packs, but after seeing pictures of the beautiful quilts in this scrappy quilt book I will definitely be picking up more! I have tried to hard to resist these cute little bundles…. I am failing. Am I really supposed to count the actual packs? Or can I cheat and say I only have ONE TOTE? I only have 2 mini-charm packs but I can see more in my future with this book! I currently have three mini-charm packs, but after seeing all the beautiful quilts in this scrappy quilt book, I will be definitely picking up more! I have two right now. Well over the 6-10! I belonged to a monthly subscription of them and couldn’t find a pattern I liked. This pattern might just be it! I just checked and I found 6 mini packs! Two jelly rolls calling to me when it gets too hot to be outside! I love what I’ve read about Oh, Scrap! I would love to win this exciting package! Probably 1-5 charm packs. But I have a roomful of scraps given to me by my guild and I am always looking for new patterns/ideas. I don’t have any right now, just because they’re SO cute, and I use them as soon as I buy one! Less than 5 but I have a substantial stash waiting patiently for a great pattern. There are 3 packs waiting to be put into a quilt. Certainly more than 10! I have no idea how many and I am not planning on counting them. My husband does not need to know. None right now. I have quite a stash of fabric but love the precuts because they give the variety and size you need instantly! I have one mini charm, love the title of the book! the only mini charms i have are part of a kit that I received as a favor at a trunk show. I guess its off to the quilt shop for more. I think I have three. I have this book already and I love it.I haven’t made a quilt from the book yet. I have zero mini charm packs but I cut most of my scraps into two and a half inch squares. I have a big ziplock bag full of the squares to use for these quilts. I believe I have only 2 right now.I’ve already collected an indeterminate number and cut edge to edge circles and stitched them into hexies. Don’t know what I’ll do with them but they make me happy. The book,’Oh Scrap’ looks splendid and definitely is a must have. I have about six of these and will be in search of a project as soon as I finish up a couple that are bothering me….can only stand to have so many not done and then it gets to me 🙂 Love the ideas in this book! Winning would spur me on to finishing up my UFOs so that I could get to use these. More than 10! I ran across some great deals thinking I would use them in a project idea that I had…..this book would be great to help me out! WAY, WAY, WAY more than 10. There is just something so cute about them! Just 1 but lots of 2 1/2″ squares cut from leftovers. I love scrap quilts and this book looks terrific! I have 4 from when I first started quilting. I have way more than 10, but that is because I already have your great book. I’m an addict for charm packs and mini charms. I just started a flag and we watermelon quilt all from scraps except for the background. I just feel so virtuous. No mini charms… but tons of other scraps! More than 10, and this book looks like it has some fabulous patterns to put them to use. Thank you for the giveaway opportunity. No mini charms… but lots of other scraps! I usually cut my own strips and squares from my stash, but I do have 4 or so of the 5″ squares (charm packs). very handy and adds a lot of variety to a scrap quilt. I love these little morsels of love…I currently make little cot covers for my girlfriends babies..little jewels of color..One hat box of charms one basket of little gems. Actually, the number is 0. But I sometimes cut scraps into 2 1/2 – 3″ squares so I have a supply for when a project such as are in "O Scrap!" comes up. More than ten. This book looks like it has some fabulous quilt patterns to use them in. Thank you for the giveaway opportunity. I only have 1. But tons of jelly rolls and regular charm pack that I could trim. I have none yet but hope to win some!! I made a big mistake and right know I don’t have any mini charm packs in my stash but, I sure would Love to have some along with this neat quilting book. I don’t have any but I do have some cut from my scraps to start working with. I have a set of 4 of the same in reserve for a special project. would love to win this prize so that i can utilise the patterns for our charity sewing group. I believe I have 2 some where. But oh my – where? Book looks really FUN! I am in the category of 1-6 mini-charms packs. But I also have lots of my own 2 1/2″ squares that I cut out after completing a project. Hate to admit this.. I have seven shoe boxes full of mini-charms. Sure would love to put them in a quilt and this book looks like just thing I need. 1-5 category and lots of cut up scraps just waiting for the right project! I have at least 40 charm packs and would love to make several scrap quilts. I love the vintage look. Gett8 g ready to build a french country house and would love to display my quilts throughout the house. I have none, so sad. I don’t have any but I have a huge stash and love scrappy quilts!! I do not have any minis. 2 or 3 mini charms. Not enough! 1-5 Mini Charms. Not enough!! I have 1-5 and a lot of cut up ones from my stash. I love scrap quilts. I have a humongous stash of scraps but honestly I have never bought a charm pack! I have many charm squares and fat quarters because I make fabric ornaments. I saw this and would so looks to make one of these. No minis but I have cut my charms into 4s. Only 2 mini charm packs but lots of jelly rolls, charm packs, & jolly bars. I don’t think I could count them. I must have at least a couple dozen of charm squares packs. They are great for scrap quilts (which I love) and to use for EPP hexies. I probably have 1 mini charm pack but I do have lots of scraps cut into squares. I would say 1-5. Good thing you didn’t say FQ’s. I don’t think I could count them. I am in the 6 -10 bracket but this post has really inspired me, thank you. At least 6-10 and it could be over 10 by now– I typically try not to count what’s in my stash! This looks like the book to bust a stash in short order. Thanks for the inspiration. I have zero charm packs in my stash (and I work at a quilting store) but I have stash enough to make thousands! I don’t have any mini charm packs, but they are tempting! Thanks for the chance to win! I have 1 to 5 packs that I got because it was something new to me. They have great color and will work together nicely. Looks like a great book! Thanks for sharing! I currently have no charm packs but I have a cake. I have a boxful of 2 1/2″ squares. Probably the equivalent of at least 10 mini packs. 1-5, but Martingale and Lissa Alexander could change all that! Right now i’m down to 1 but I’ll be heading to the quilt shop tomorrow! 6-10 Love the red centres. Maybe 1 or 2. Scrap quilts are all I do since my first scrappy nine patch baby quilt for my nephew 27 years ago. No mini charm packs in my stash but I do have some 2 1/2 inch squares cut from my scraps. Probably a dozen or so, not counting all the 5″ squares I have cut and stored for Quilts of Valor!! I only have 4 but I am starting to collect for a quilt I want to make. Hoping to find some on sale. No mini charm packs but dozens of charm packs waiting to be used that could be cut into mini charms. Maybe I better go to the quilt store just to make sure they don’t have a better choice. Any excuse is a good excuse to go to the quilt store!! I DO have a ton of fabric and this book looks like a great one, thanks for the chance to win! I have several, as well as lots and lots of scraps in include! What a sweet, sweet pattern! Looking forward to seeing this book! I’m new to charm packs so would love to try some. I have only one mini charm pack, but I have hundreds and hundreds of my own minis made from my scraps. I find so many uses for that size. Probably 8 or so. I’ve just used a few. Love mini charm packs. I don’t have any purchased mini charm packs, but I have cut a ton of my own from leftover garment scraps. Far too many actually! I would love to win the book! I probably have 6-10 mini charm packs but many more jelly roll, layer cakes and 5″ charms! I also have too many to count and guessing I have over 20 with matching jelly rolls, border, backing & binding fabrics. I have zero mini’s but have over 20 charm packs with matching jelly rolls, border, backing & binding fabrics. More than 10. I’ve got my work cut out for me. About 5 but will use them soon. I will need more, so hope to win. I have 5 mini packs that I keep handling and putting back on the shelf for the "right" design. I don’t have any mini charms, I’ve used what I had, I do have jelly rolls ad charm backs ready to cut up, I love scrappy quilts and find my family and friends like them too!! Thanks for the chance. I hope this isn’t a duplicate, but I didn’t see my post show up so I’m sending again. I’m sure I have more than ten charm or mini charm packs as well as lots of coordinated scraps. It looks like there are some wonderful quilt pattern in the book that would look lovely using them. Thank you for the giveaway opportunity. I think I just have 1…a few more are on my shopping list!! More than 10 – I was fortunate to win 15 mini Moda charm packs from one of the Quilt Market gatherings. I’ve been wondering how to use them, and winning this book would be great! There are probably at least half a dozen. Who knows for sure what might be hiding in my sewing room among all my scraps! I have more than 10! Probably have 8 minis. And way more ideas than time to make them! Heading to the fabric store now! I have about 1-5 mini charms plus a bin of 2 1/2 square I’ve cut myself from scraps. No charm squares but 6-8 jelly rolls. I can make charm squares easily out of them. I will definitely purchase some charms now. I would love to win which will get me started. I have 4. They are solids and I need some inspiration! Sadly, I don’t have any minis, but I have a lot of 2 and 3 inch scraps. I would love to have this book! I don’t own any of the small precuts. I love the patterns with the small cuts and think they would takeaway a lot of the cutting work. Getting finished is my big goal and I could use the inspiration. And the colors are so happy. I probably have around 10, but tons of 2.5” squares cut from my scraps! I have no small charm packs presently. I have not seen then in the shops I use or maybe I just did not see them. I would say that I only have 1 – 5 charm packs right now. Thanks! I have at least 10 charm packs in my stash. Some are with the matching layer cakes or jelly rolls so I have a better chance of making a quilt with the different size pieces. Love precuts. I have 7 but can always use more! I actually have only about 12. Not many but I bought them hoping I would find a good use. Just a few lonely packs in search of a project! Nessun mini, ma presto li acquisterò! I am brand new to quilting. Sadly I have NONE, but now that I know about them, I am headed to the store! Only 1-6 in my stash, but I have been known to cut the 5 inch squares into minis! Love the ideas in the book. I only have one mini charm pack but have considered cutting into my dozens of charm packs to make these quilt patterns. I would love to make a scrappy quilt. Headed to the quilt shop although I do have a bunch of fat quarters. The book looks very ineresting. I have four or five, but LOTS of scraps!! Well, to be honest, I have non. But I have a little stash that I could turn into a nice little bundle of charm squares. I am just a beginner, and started just a few months ago with my first ‘big’ quilt. I only have one mini as I lean towards larger pre-cuts, but this book may change my thinking. It looks like such a fun book. Thank you for the chance to win. Have a nice Memorial Day. I love fabric but sadly I only have 2 mini charms packs and a box of leftover mini charms from making Mondo bags. This book is a great way to use the little bits. I am always looking for more fun ways to piece quilt tops. Thank you for saying I intend to make… but then something else diverts our attention. How true this is for most of us. Sadly enough, I have non. I just started my first quilt, and have only a very tiny stash. NONE!! The only pre-cut I’ve ever used is a fat quarter. Looks like I’m one of those who need to get to the quilt shop! Thanks as always for your generosity. None now. But I do have alot of Jelly Rolls and 2 1/2″ squares. Love working with precuts. I only have one but I wish I had more than 10! I have no mini charms (2.5″ squares) from a specific collection, but I have at least 300 minis from existing scraps in my stash. This book would surely help give them a home. Thanks! I have two, plus several jelly rolls. I have two packs of mini-charms. One of them I received from a very generous person for free when I ordered some other fabrics from her website! Wow! I have taken the two packs that I have and pulled scrap from my stash to create more mini charms to go with it. The mini charms, whether in a nine patch or whatever, make beautiful and quick baby quilts for an instant gift! I have more than ten. They are so much fun and give you a Big Bang for your buck! I have at least 10 mini charm packs. I would love to use them for any of the patterns in Oh Scrap. I am down to 3 right now…..need more asap! I have no charm packs of any size–only those squares that I have cut from scraps or some I might have inherited. However, I have tons of scraps leftover from projects and scraps quilts are one way to use them up. This book would surely help with that. Ohhh . . . more than 10. And am never quite sure how to use them. This is great motivation to get sewing! Thanks for the post. Currently I don’t have any mini charm packs in my stash . 2 — but I haven’t tried them yet! I don’t have any charm packs in my stash. I always think I should be using up my scraps but that rarely happens. 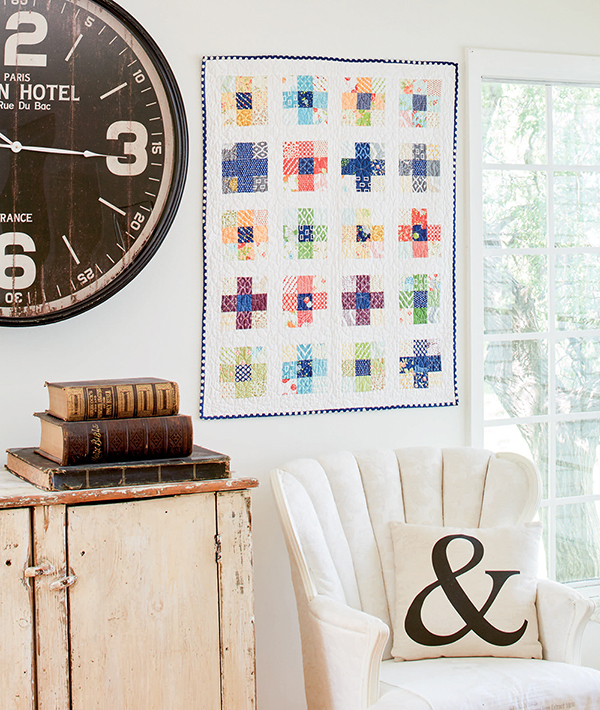 I just love the look of that Scrappy quilt made with charm packs and would love to try it. 1 to 5, but there are jelly rolls and fabric by the yards! I have between 6-10 mini charm packs. I have 6 – 10. I always look at them and don’t know what to do with them. I guess Lisa’s book is the answer. Sadly 0, but I do have a few jelly rug ools and a huge scrap stash. Would love this book. So fun! I don’t have any of these mini packs. I run a not for profit organization. We make quilts for kids in the hospitals or kids in need. I am always looking for easy patterns to use to make these quilts. I do have a few people who save their scraps for me but it’s time consuming to cut all those scraps into usable pieces. Even so, we have made more than 3500 quilts. Great ideas in this book. Without searching, I’m going to say 1-5 mini charm packs. I’ve used a few and haven’t bought any lately… they are so appealing though!! This book looks like a lot of fun! Oh, Oh, should I confess I’ve never bought a mini-charm pack? I do have a bazillion 2 1/2 inch squares in my stash scrap bin. 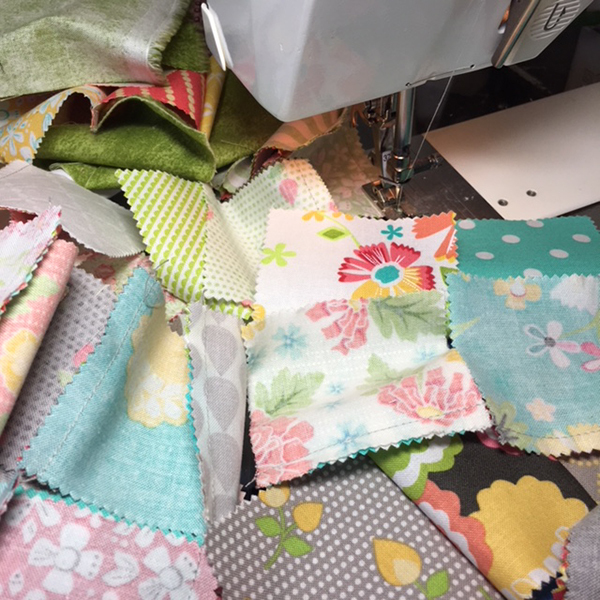 No mini charm packs here… BUT, since I cut up my scraps into pre-cut sizes, I do have a whole bin of 2-1/2” squares to be used! Probably about 50 mini charm packs worth! I’m in the 1-5 category but I just bought 2 this week that I think would be perfect for this quilt! Fingers crossed for the book giveaway 😊🤞🏻!! I have 6 to 10. I love getting one as a freebie when I order fabric…or on sale to test run a line of fabric. I have many squares from my fabric scraps which I immediately cut into 2 1/2, 3 1/2, 4 1/2, or 5 1/2″ squares and store in shoe boxes by size. I have 2 or 3 but am now tempted to buy several more the next time I’m in a quilt shop. an excuse to go shopping for fabric! Zero, I’m afraid. My LQS doesn’t really carry too many precuts. But mini’s and layer cakes are my 2 favorites. I’ve got Lissa’s book on my wish list, maybe I won’t have to wait too long now! I have about 15 or so….just waiting for the ‘right’ project…LOL! I have 4 mini charms, and several 5″ charm packs ready to use, just need the inspiration to get started. Thanks for getting me going on using these to make something special. I have more than 6; less than 10, I think? I just received the book – it’s wonderful and need to start something from it soon. Lissa’s style is great, casual and very easy to see a finish quick! Headed to the quilt store now! I have way more than 10 and I am a fabriholic!!! I have 1-5 minis, but more charm packs. I have 4 mini charm packs. But don’t ask me now many charm packs I have! I don’t have any mini-charms right now unless you count the small boxes of squares I have cut and stacked in boxes ready to make something really cool! I don’t have any mini-charms from a specific collection, only squares I have cut from my scraps stacked in boxes by sizes ready for a new creation. 6-10. Time for a new project! I’ve never bought a charm pack or jelly roll before. Oh Scrap is making me itch to get several NOW!!! I’ve always loved scrappy quilts others have made but mine fell flat. This article is a light bulb moment for my fabric selection. I’m so excited to start sewing! I have 1-5 packs with a shoebox full of cuts from my stash. 1-5 is all that I have. And I don’t really know what I am going to make with them. I had something in mind at the time, but used something else, and now they sit idle. Help! I have over 10 (cause I love the tiny ones!) 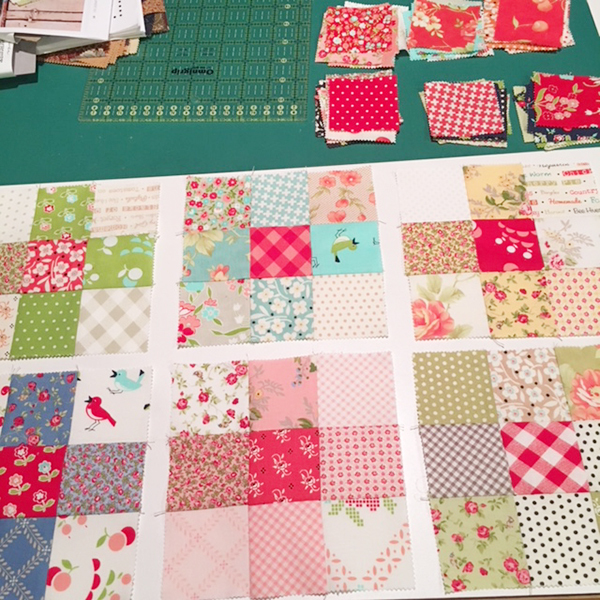 not counting all the 2 1/2 inch squares in my scrap box….don’t really know how that happened, but I love the idea of using some up as mini quilts! 1-5 actual charm packs but many 2 1/2” squares left from other projects just waiting to be thrown into the mix. Mini charms, I only have a few. But jelly rolls and layer cakes, that’s a whole other story. I have loads of those! I fall into the 1 to 5 category for mini-charms, but don’t ask me about fat-quarters. I don’t think I can count that high. I don’t have any charm packs in my stash. I never buy them because I always think I will use my scraps but never. I just love that quilt and sounds like fun to make. Only one. But in my stash are many 2 1/2″-blocks waiting. I do not have a single mini-charm packs, but next time at my local quilt store I will looking for them. I have three mini charms and wasn’t sure what to do with them. I just might have to try the project featured above. Thank you for the giveaway. I have 10+ packs of mini charm packs. I bought a bunch for a hexie quilt, and then developed some wrist issues that kept me from doing any sewing by hand so they have just been sitting waiting for a different project to catch my eye. I have none – I am just getting started with quilting, and need all the help I can get!! I only have 1-5. Obviously, I need to run to the quilt store. I bought ata quilt show. Now what should l do? I have one mini charm. I’m more of a jelly roll girl. AS of now I don’t have any mini charm packs. Think I’ll have to go buy some!! None, I’ve only used fat quarters, charm packs and layer cakes. I have zero mini charm packs–will have to hurry to the fabric shop to remedy this situation! I don’t have any. woe is me. I have 2–not nearly enough! Have 0 mini charm packs, but what a great idea. Have lots of fabric that could be cut to size, but have no book for using 2 1/2’s in patterns. Please enter me in the drawing! I have 5 right now! I don’t have any mini charm packs. I do have lots of fabric scraps and I am very inspired by your project and I would enjoy the book. There is no Quilt Shop in my town. I only have 1 mini charm pack, but quite a few charm packs. I have 3-and drawers full of scraps that I could/should cut into my own mini charms! I ahve about 5 mini charm packs. I love scrappy quilts the most and always have 2 or 3 going at the same time. thanks for the giveaway. I don’t have any mini charm packs, but I’d love to try this quilt. I have 4 great nieces and 1 great nephew so this design would be great for all 5. Two plastic boxes of that size here as I cut scraps to prep for future "mini charms" projects! I have 4 although I had forgotten all about them! No mini, but I have bought some and made cute table runners with them. Unfortunately I don’t have any mini-charm packs in my stash. After seeing the lovely patterns in this book, I will definitely be adding them to my fabric collection. Thanks for the fantastic giveaway! Unfortunately I don’t have any mini-charm packs in my stash. After seeing the lovely quilts in this book, I will definitely be adding them to my fabric collection. Thanks for the fantastic giveaway! I have 4 mini charm packs. I bought them because the fabric was so cool but really didn’t know what I was going to do with them….now I know! I have at least 20….love the little gems. I have 4 charm packs but I don’t think they all match each other. I’m going to shop for more with the hope of winning this book. I would guess that I have 10 to 15 charm packs. Would love to add more. I have one mini that was gifted to me several years ago. Now I know how I’ll use it after I buy more. Oh gosh well over 10. Better not to know the total. In this moment I have only half of one… but I hope that change this week, I m waiting the mail. More than 10!! Lots more!! Since my 10 yr old daughter and I will be working on a baby quilt for her teacher…. I am headed to the quilt shop right now! I only have ONE, but it looks like so much fun! I have never purchased any mini charm packs , but am vertualy overrunwith scraps! Now for the time to sew them into quilts. I am retiring soon from my full time job so here’s hoping!!! to make some small quilts. I have seven in my stash, and your quilt is just lovely! I have 5 or 6 packs, many were gifts from friends. 1 to 5, always happy to buy more! I don’t have any mini charm packs but lots of scraps. What a fun way to use them! I have three mini charms and this book has some great ideas on how to use them. Thanks for the giveaway! I have 3 mini charms and it looks like this book has some great ideas on how to use them. Thanks for the giveaway! I have 3 mini charms and this book looks like it has some great ideas for them. Thanks for the giveaway! I have 3 mini charms that I’ve been looking for ideas for. Thanks for the giveaway! Just counted, I have 14! I believe I have 2 mini-charm pkgs. This book looks great! I only have 3 or 4, but that’s because I have so many scraps to justify buying more! Thanks for the give away and all the inspiration. I have about 5 mini charm packs just waiting for these ideas! OOPS…. Went into my textile collection boxes to check on a project and actually found a few mini-charm packs. Who knows if I’ve stashed any others, so I guess I’ll say I have a few… that’s my best guess right now. Regardless, I’m going to put "O SCRAP" to good use and cut or buy some more…..
I’m in the 10 and over category. I didn’t see the need for them at first – just cut a charm pack in quarters – but then saw the time-saving benefits, and the ability to build a scrappy collection. Hoping to receive the giveaway, although I have the book on my "to purchase" list just in case I’m not fortunate. I don’t have ANY! Clearly I am in dire need of a shopping trip, or maybe I just need to win a giveaway. Thanks for the chance. I have about 10 mini charm packs in my stash. I love the minis and have made one small quilt with minis. Thanks for a chance to win! None! I usually end up making them out of left over scraps and add them to the pieces I’ve collected from thrift stores! I love this cheery pattern and fabric line though! Probably have 4 mini’s waitng patiently in a box screaming for attention! More than 10! Love them, they’re so cute! WOW!!! LOVE these quilts as my favorites are scrap quilts. Hope to win the pattern and fabrics–would get me to a fast start. I do not have any mini charms so would love to win this. My favorite is scrap quilts so this would get me to a fast start. I think I have between 6-10 mini charm packs. Lovely book. Thanks for the draw. I have two mini charm packs. I got them to use as cornerstones for blocks. I tend to cut charm packs into 2 1/2 inch squares if I need them. I also have a Velveeta box filled with hundreds of white 2 1/2 inch squares. I use those for all kinds of squares. I guess I will be cutting a lot more charm packs. I will be checking out this book. It looks very interesting. I’m not sure…around 10 or so. I don’t often count my charms unless I’m putting them in a quilt. I do love the pre-cuts though. It’s life made easier. I have one bag of scraps for a mini paper piecing flower 🌸 garden project and two boxes of scraps ready for the next project! I like the book projects you gave us a sneak pieek at 👀 . I would enjoy winning this give away 😊🦔🌴Yes please! Thank you for letting me try to win. Hugs!!! I have 2 in my stash at this time, lovely quilts! 5 mini charm packs and had no plan for use. This book will change that! I currently have 3 cute, depression era, reproduction mini charm packs in my fabric collection.I too love precuts! I don’t have any mini-charm paks in my stash, but don’t ask about regular charm packs!!! I can’t get enough of them! I don’t have any mini charm square packs but after seeing the quilts you made, I am going to invest in a few along with the book. Way more than 10! Always looking for ideas to use them! I have more than 10 mini charm packs, so I’m ready to make that quilt! I’m sorry to say I have 0 mini-charm packs, because I did not know such a thing existed! Have plenty of leftover 2.5 inch squares, but I definitely need to get to my quilt shop and look for some . . . Thanks for letting us know and thank you for the opportunity to win the book. I have a grand total of 2 mini charm packs, as I thought layer cakes made more sense to buy. Your blog post has me rethinking that idea! Without counting I have about 5 charm packs, but probably closer to 10. I Love Scrap Quilts! Awesome book! I have 3 mini charm packs but I have too many jelly rolls and layer cakes to count. I love the personal account of making the quilt- a great way to sell interest in this book! I am in the 1-5 category. I’ve had more, but they have been used. I have 3 mini charm packs waiting for a project. I have no mini charm packs. I rarely buy pre cuts, except for fat quarters.. But the patterns shown are lovely. I don’t know the exact number because they are loose now, but there are more than 10, I am sure. I have a few min charm packs and a few charm packs. Definitely the 6-10 range *wink*. What a wonderful inspiration. I have never bought pre-cut packs, usually swapping with friends to make my collection. But I have now moved 600 Km away from my friends and sewing group and am feeling very isolated and lacking motivation. This would get me sewing again. I only have a couple of the mini charm packs, as I wasn’t sure where to start with them. Now I know and I am eager to get started! Scrappy Ho! More than 10! I love buying them and don’t break them open as often as I should. 7 or 8 – I usually get them as door prizes or at quilt camps. Now I have some plans for those cute, little puppies! I only have a few, 1-5. These projects make me want more! I have zero! I never think to buy them, but this book has inspired me to guve them a try. I think they would save me space, since there is no waste. I love how the designers put their lines together in a little package, which allows you to see every fabric and then choose what you might want more of. I have one set of mini charms in my stash right now. Just may use it for a baby quilt for our newest member of the family. The colors are bright and cheery for a baby girl. Only 1-5 in the mini charm pack range. Way more than 10 in the 5″ charm packs though. Unfortunately, I have no mini-charm packs in my stash right now. However, if I win Lissa’s book, I will definitely have to go to buy some. What a spectacular book! I have 1 in my stash. I don’t have any mini charms but I think I need some and this book. I have 8 mini charms – I tend to accumulate much larger pieces of fabric !! More than 10, probably more then 20. I could open my own fabric shop!!!! Only 2. I’m more tempted to buy charm packs. Having ideas for using mini charms would be great! I need to get to the quilt store!!! I don’t have any minis!!!! I love charm packs and have about 10. I only have 1 mini charm pack. This project is a great inspiration to use them. Thanks! I have 3 mini’s in my stash right now. I have 4 in my stash and would absolutely love to win this book!!! Thanks. I am in the 1-5 category. I have mostly the 5″ charm packs and a lot of those! Love your scrap quilt, it is so fresh and springy. I have a few projects for the mini-charms, just need to get at them. Would love to win "Oh Scrap". I think I have one charm pack and 2 minis right now. This book has been on my radar since it came out, I’d love to win a copy! I seem to use these as soon as I buy them — my answer would be headed to the quilt shop right now, as I think I have used the last! Love the quilt! None., I make my own from all the scraps I receive from a friend. She has a large stash but doesn’t like using smaller pieces. I get leftovers by the bag full, and cut them into shapes before adding to my stash. I love scraps, and I use this size quite often. way more than 10! LOL! I have about 5-6 packs of mini charms- I think I need to pull them out so I can do your quilt!!! I probably have at least 15 or 20. I say you have to grab them when they are there before their gone. I love all the new colors. Trying to use some in a new quilt though.